I’m here at last to announce Frosty Festivities 2015! Keep reading for more information on this fun & free event, and for a chance to enter the announcement giveaway! This time, due to my busy life, I’ve decided to run it as a month-long event (instead of cramming it all into one weekend). There will be at least one post a day from the 1st to the 30th of November. If you’re new to my Frosty Festivities event you should be prepared for lots of Winter and Christmas crafty inspiration (including scrapbook layouts, cards, diy gifts, home decor, and more), plus giveaways and challenge prompts (giveaways and challenges will stay open until the 6th of December)! I would like to have a blog hop, but I haven’t arranged one yet! Would anyone like to join in with a blog hop on Sunday the 15th of November? 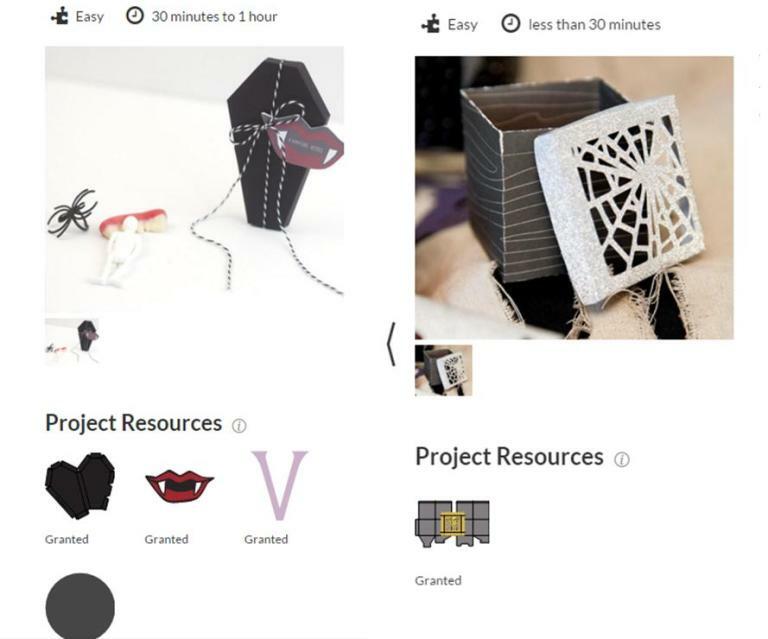 You’d just need to post a winter or Christmas crafty project, then link to the next person in the hop. If you want to join in please email me by Sunday the 1st of Nov at jennifergrace(at)hotmail(dot)co(dot)uk. 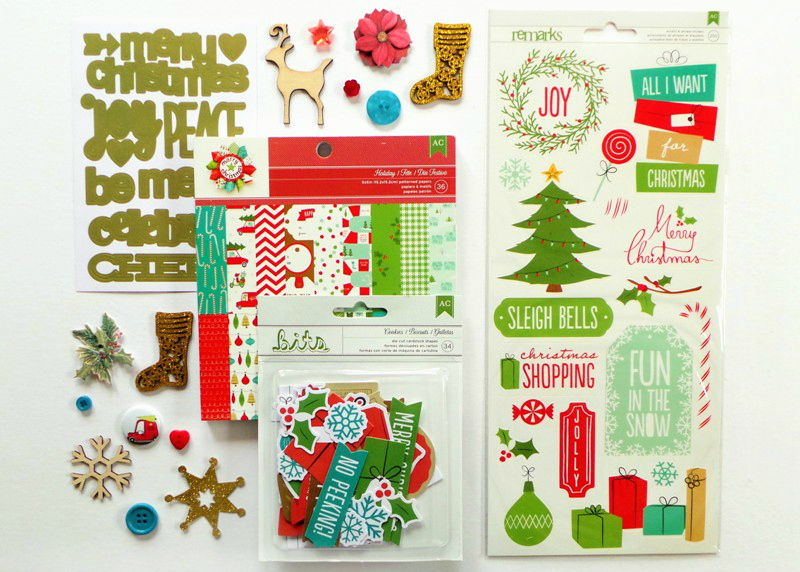 The prize includes some American Crafts Be Merry stickers, ephemera, and a 6×6 pad, as well as a few other Christmas bits-and-pieces I found in my stash. Please note: To enter this giveaway you must click on the Rafflecopter Widget below. Just leaving a blog comment won’t enter you – you need to then click on rafflecopter to say you’ve commented. Leaving a comment isn’t mandatory – and you can also complete other options, like sharing this post on Facebook or Pinterest, for more entries! Of course you can also comment and share without entering the giveaway if you wish. One winner will be chosen at random from all entries. It is open internationally. The giveaway closes on Monday the 9th of November at 12am GMT. The winner will be announced on the post for that day. I hope you are excited about the event and the season. Tell me what you are looking forward to in the comments below! 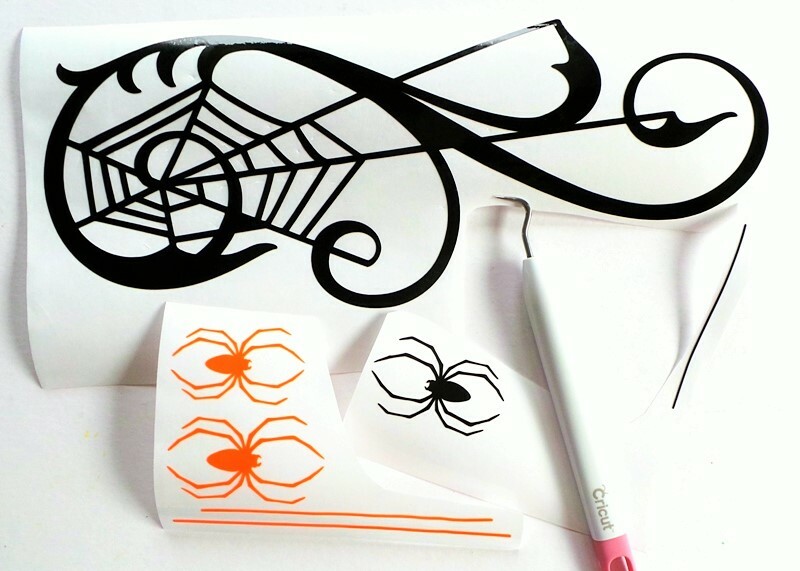 This year Cricut EU have again challenged some bloggers to create a Halloween project using our Cricut machines. Last year I won the contest with my Halloween Hallway, so of course I was happy to take part again and create something new for Halloween! 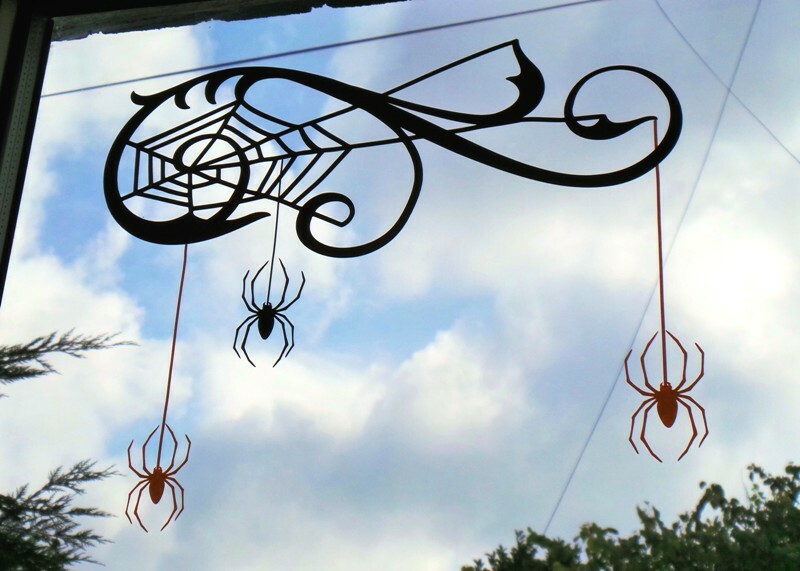 Cricut sent me some Window Cling, Vinyl, and Iron-On Vinyl, and I had so much fun using them. 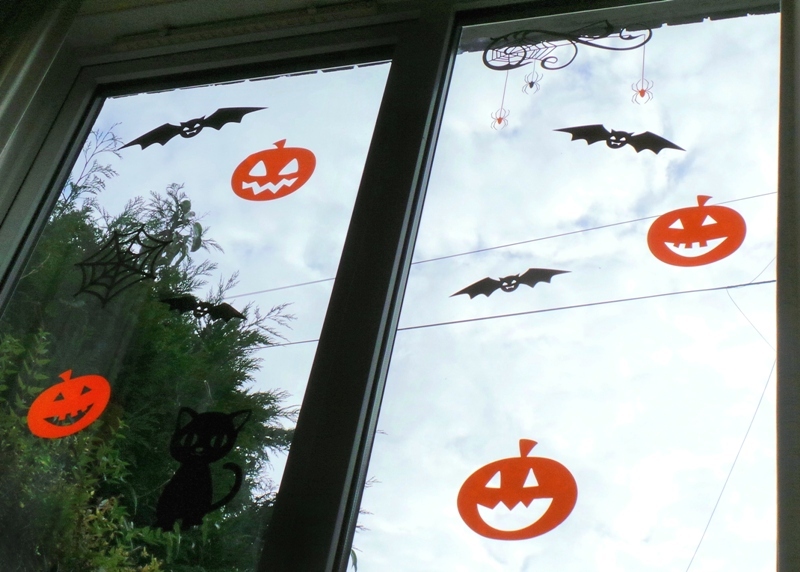 The kids were super impressed with the room, though of course they are now really excited about Halloween and I had to explain it’s still 2 weeks away! After a few frustrated words (!) 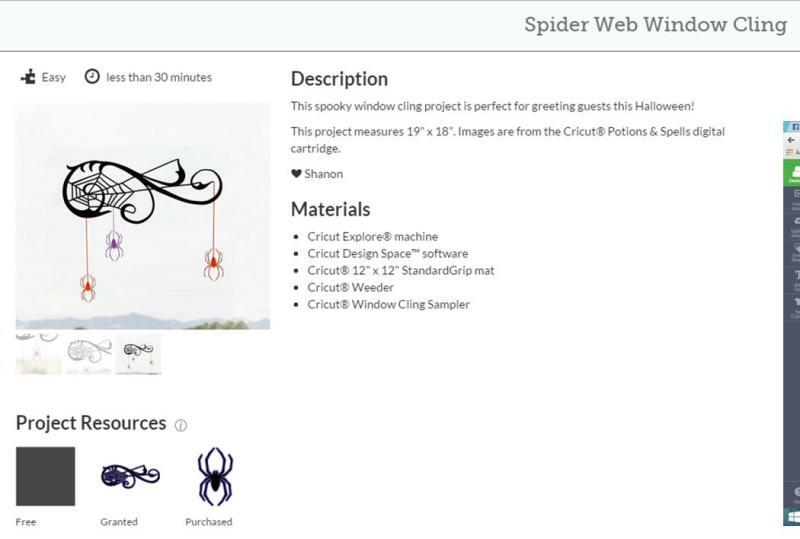 I went back to look at the ‘Spider Web Window Cling’ instructions from the landing page, and I discovered it sent you to look at THESE INSTRUCTIONS for window cling. I found out I should not be using transfer tape at all, but instead I should be reversing the image before cutting it, and using the backing of the cling material to help transfer it to the window. 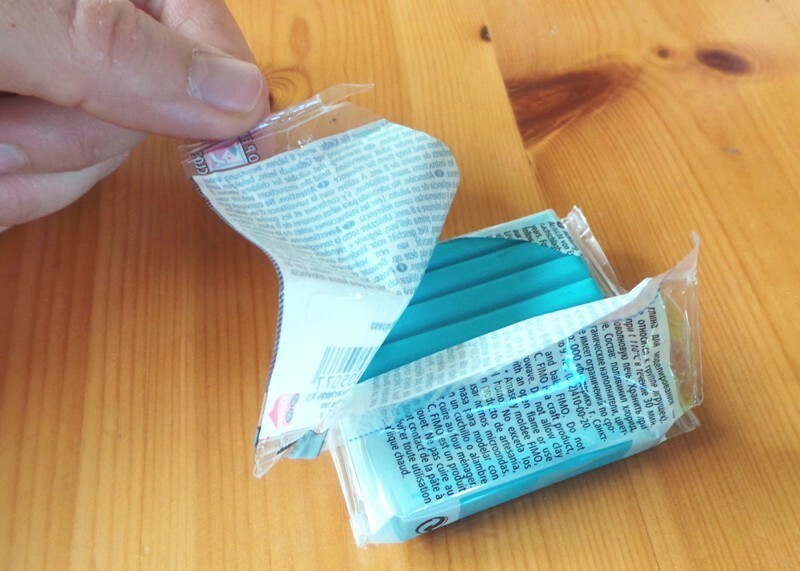 Now I felt rather silly – I’m always telling hubby off for not reading instructions! They were a lot easier to apply to the window! 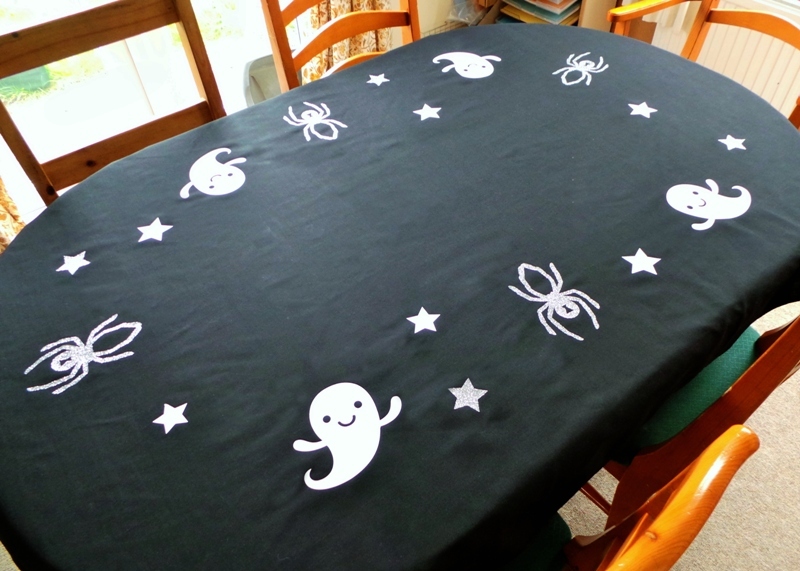 Next I wanted a dramatic tablecloth. 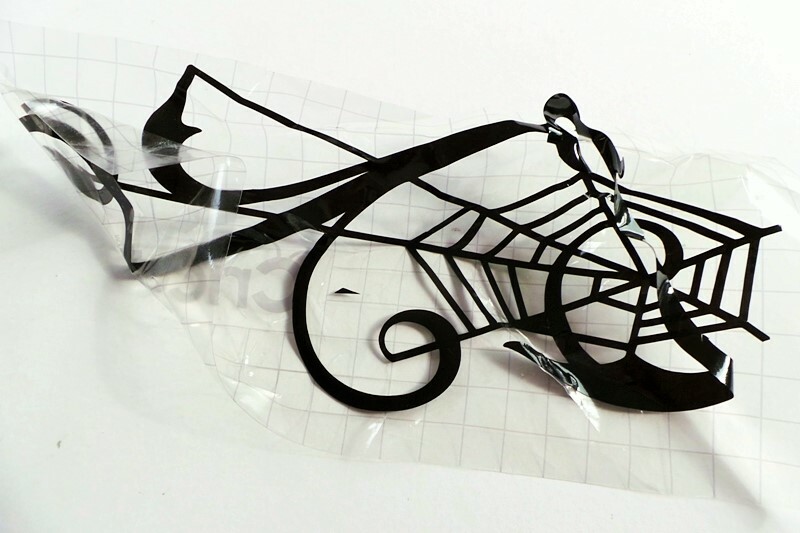 I bought a big, cheap piece of black material, and looked for some images to cut from white and silver glitter iron-on vinyls. I chose some ghosts (#M3D1D70) and stars (#M4520B) to cut from white, and some spiders (#M46A3F) and the same stars to cut from silver glitter. And I put them together to place inside a plastic pumpkin treat bucket that belongs to my kids. 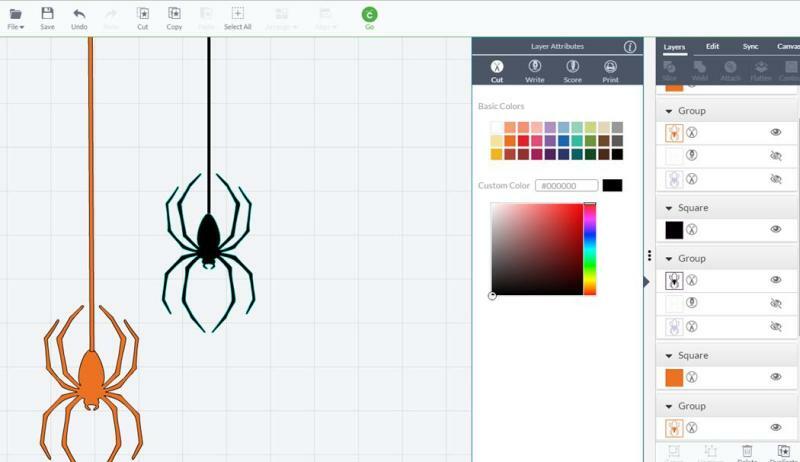 The spider web box was difficult to put together, but luckily I found THIS TUTORIAL to guide me through it! 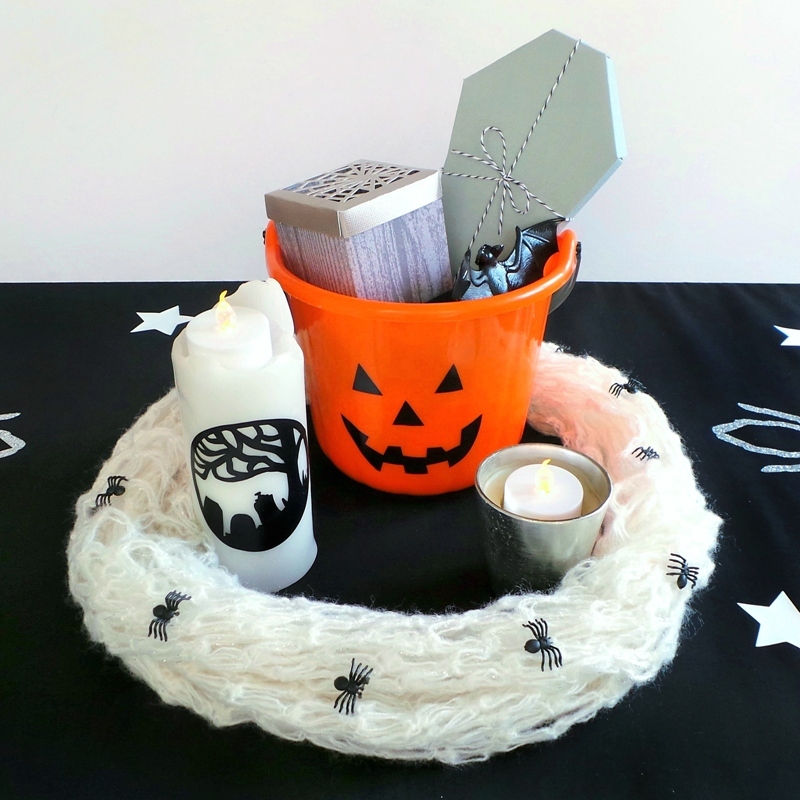 I’ll also point out I’m using flame-less LED candles on top of the candles, rather than actually lighting them – after hearing how Claudia Winkleman’s daughter was horribly burned because of her witch costume I will always avoid flames when the kids will be around. 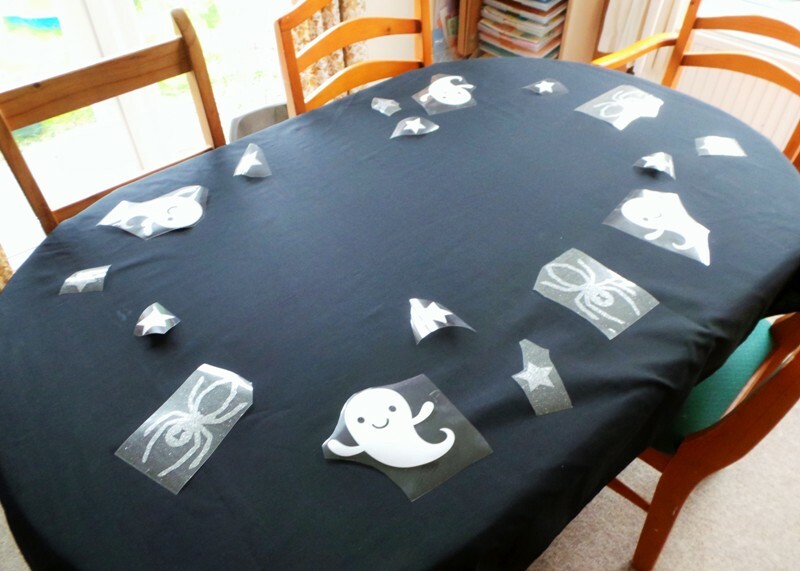 The table just needs some treats and snack on it when the day finally arrives! What do you think, spooky enough? 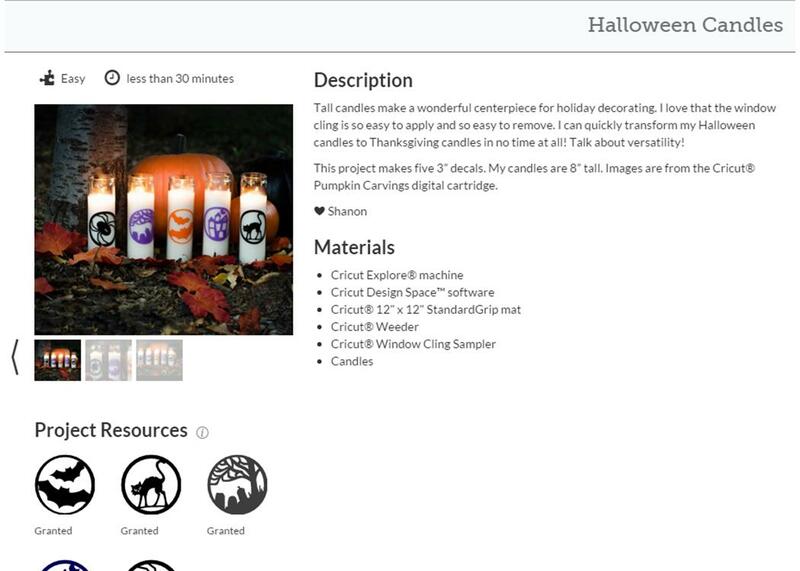 I think the candle with the vinyl graveyard on is my favourite bit, and I’ll be able to easily swap it for a new design after Halloween! 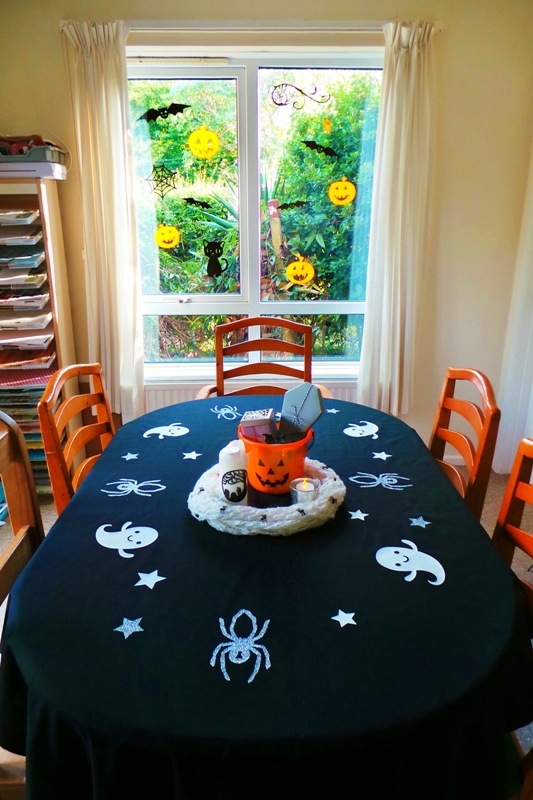 If you need any more Cricut Explore Halloween inspiration check out this amazing Haunted House by Cosmic Strawberry, this Toilet Monster by Mum In The Madhouse, or these Table Decorations at Blue Bear Wood – the Cake Stand Tutorial on her craft blog Zing Zing Tree is particularly cool! 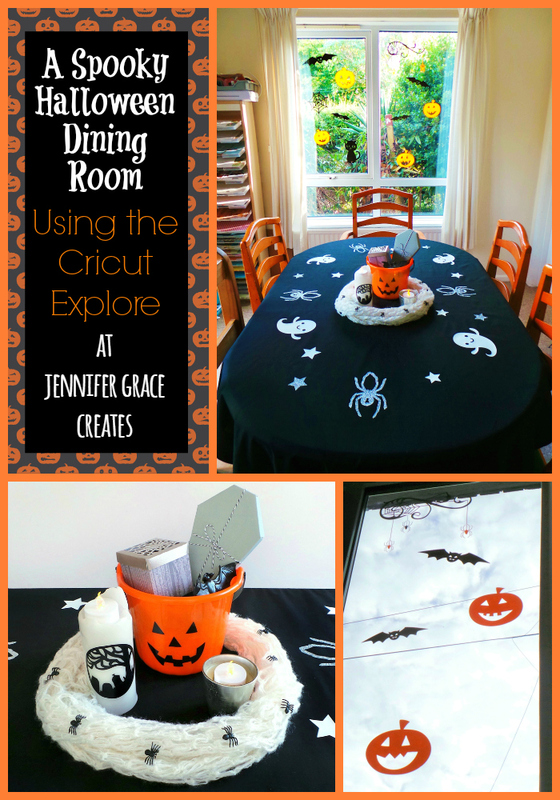 I’m linking up to a couple of Linky Parties – Spooktacular Halloween and Inspiration Monday! 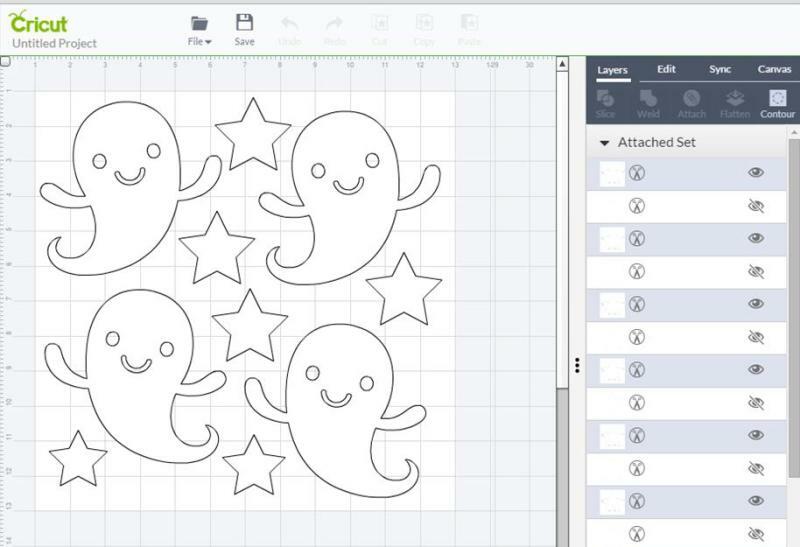 DISCLOSURE: Cricut have provided me with a Cricut Explore Machine, some materials including vinyl and window cling, and access to the Image Library, to help me write this post. However ALL opinions in this post are my own and not governed or controlled by Cricut in any way. 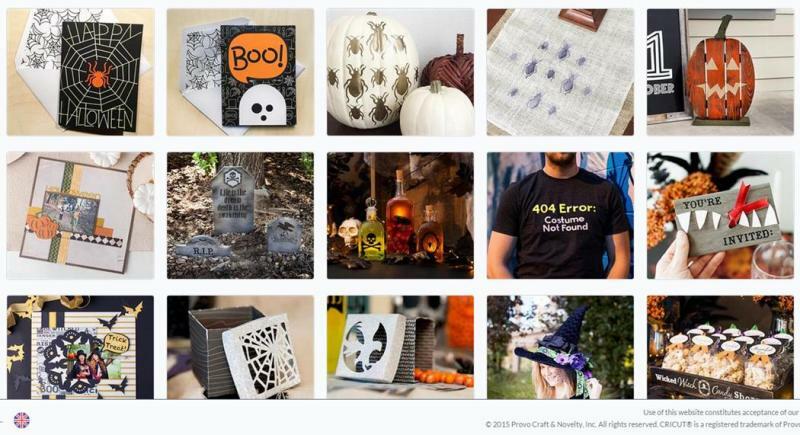 I’m also entering this into a Cricut bloggers Halloween contest. 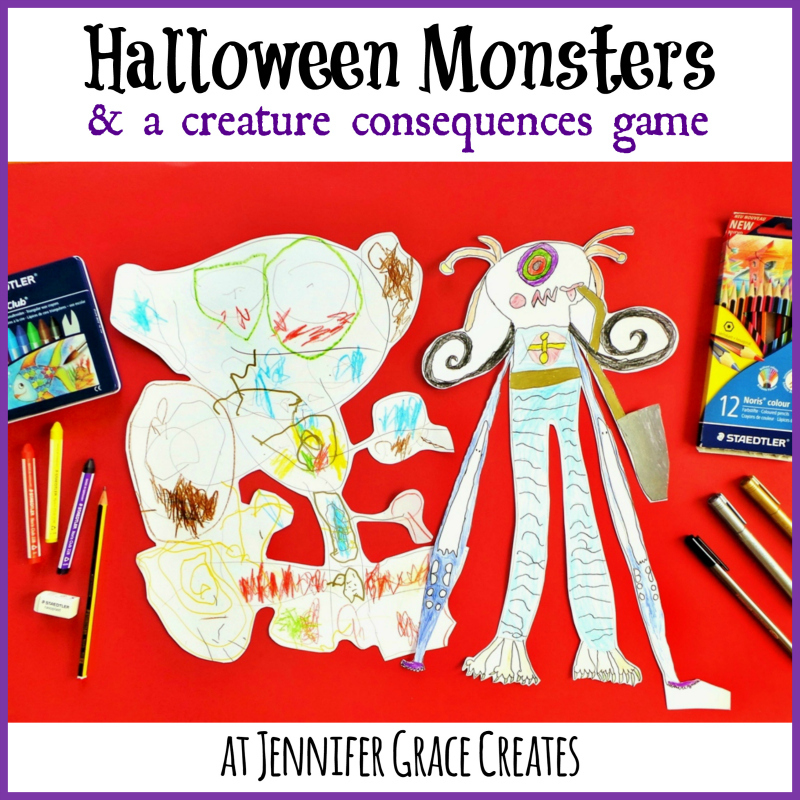 Halloween Monsters + Creature Consequences Game! Hello all. Sorry it’s quiet here lately. As well as my part-time job in the school library and my volunteer work running a Rainbows unit, I am now also the Chair of the very busy PTA at my kids school. So my blogging is running a little behind. I hope I’ll find my groove eventually as my crafting and blogging is my haven from all the madness! Cheeky Boy’s is on the left, and Little Miss’ is on the right, in case you can’t tell! 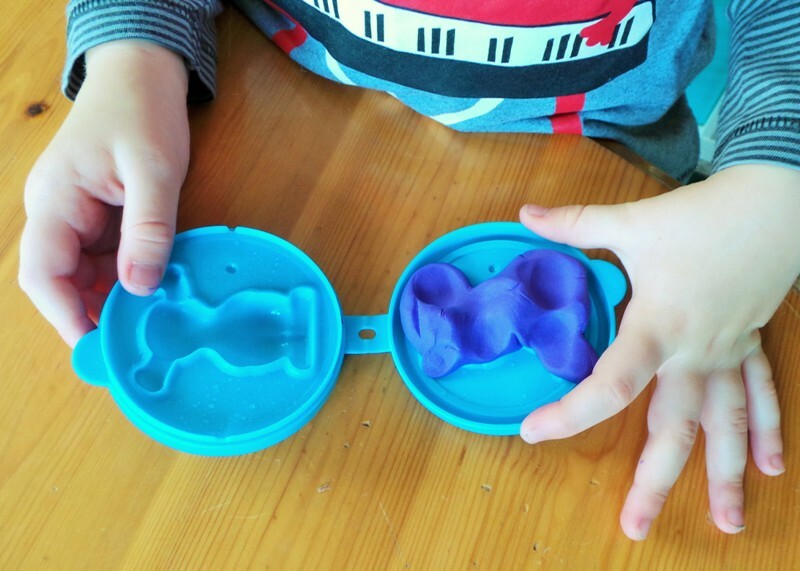 I was actually quite impressed with Cheeky Boy’s monster, it’s the first time I’ve seen him concentrate on getting eyes and ears in the right places. 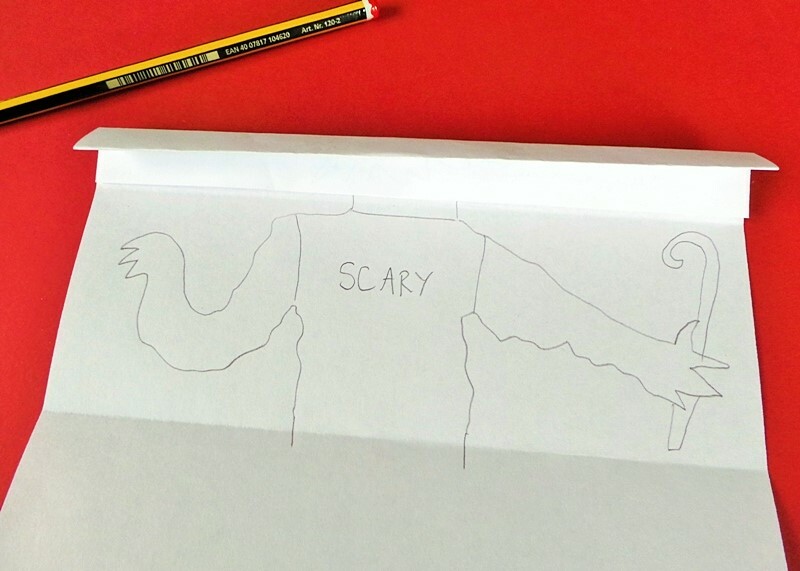 I almost tried to explain that monsters could have eyes and ears in the wrong places, but I thought that would totally confuse him at this stage of his drawing development! He did give his monster a wind-powered water canon, so that was creative enough! 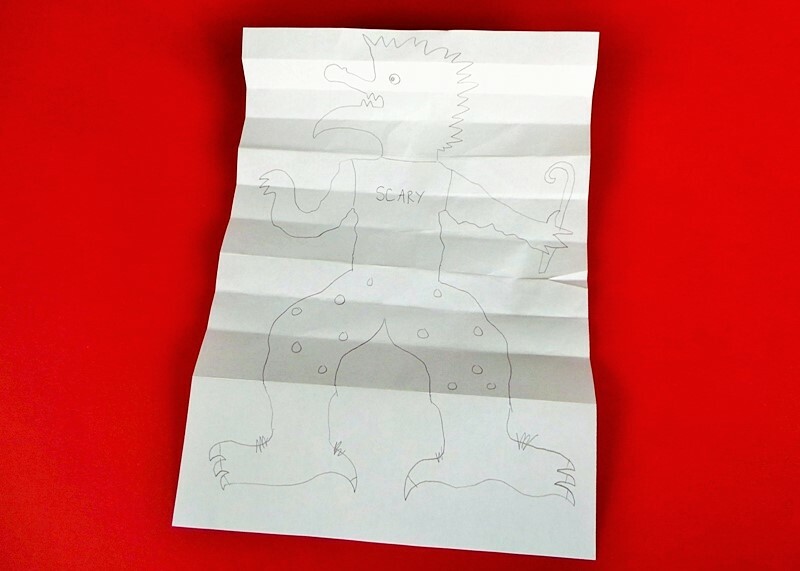 I’m going to show you how the game is played – these drawings are all by me as no way would the kids let me take photos during game time, but normally you pass the paper around to another player between each fold. 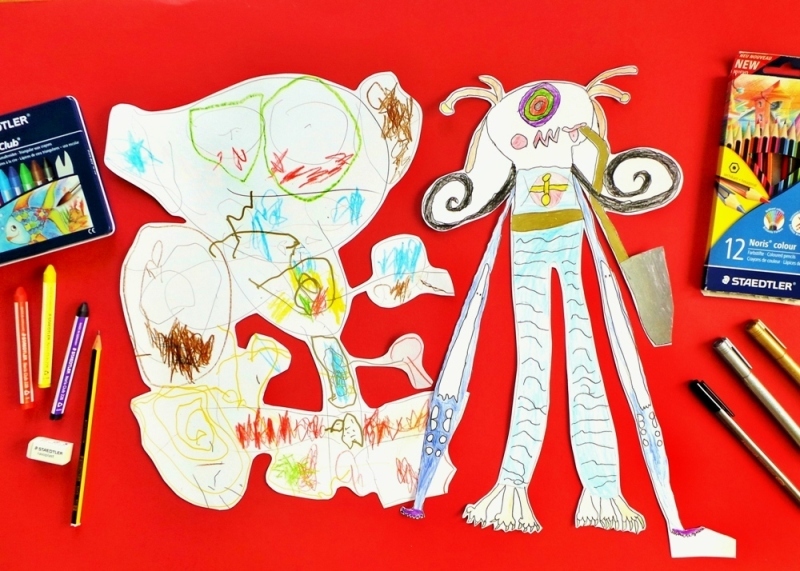 The kids giggled a lot when they unrolled the monsters! This is a great game as you can play it with any number of players. 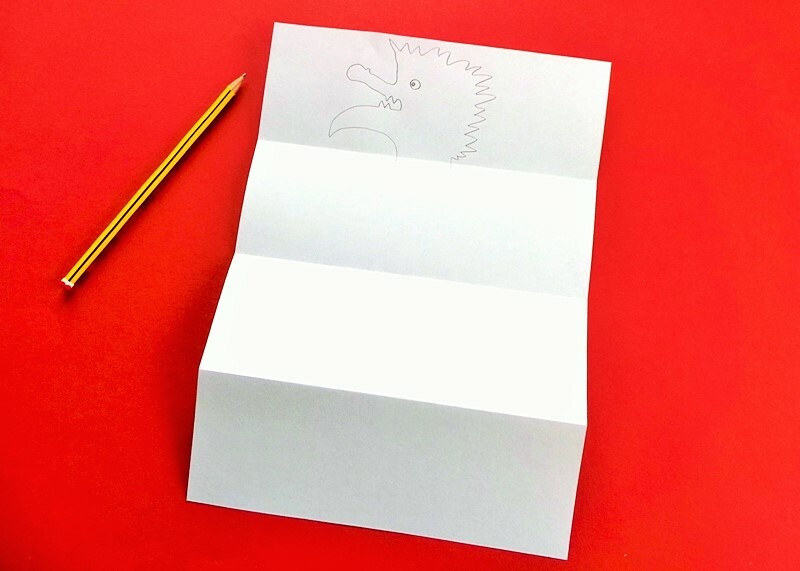 You could also use it for developing characters for stories. Or there is a ‘story consequences’ game where you write a boys name, a girls name, what he said, what she said, etc… rather than drawing. 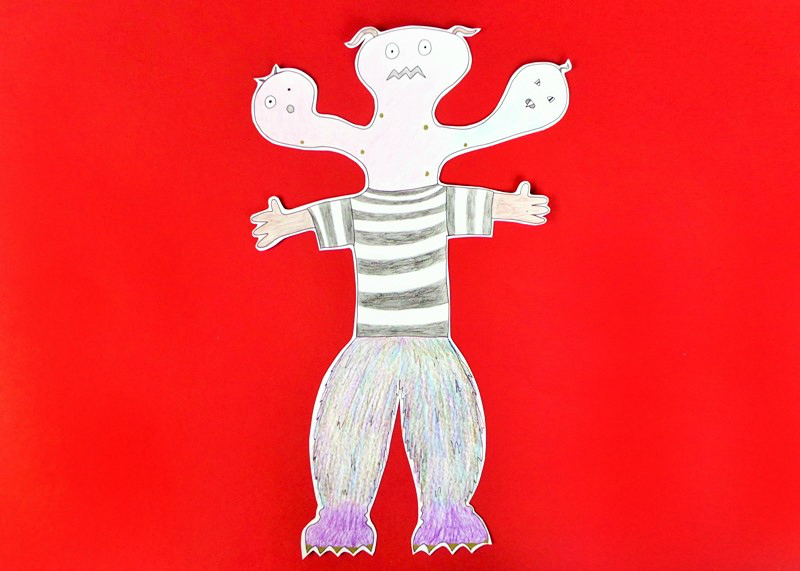 Creature Consequences is great for Little Miss’ age (7) but was a bit hard for Cheeky Boy (age 4). I certainly wouldn’t play it with more than one child of that age. I did have to keep peeking at his to remind him to cross the picture over the line just a little bit. But he really enjoyed it and I know it’s something we will play again! I love how unique they are! He’s got gold toenails. I was really impressed with how well the gold metallic marker showed up on top of the purple pencil, these metallic markers are great if you want to draw on top of dark colours! 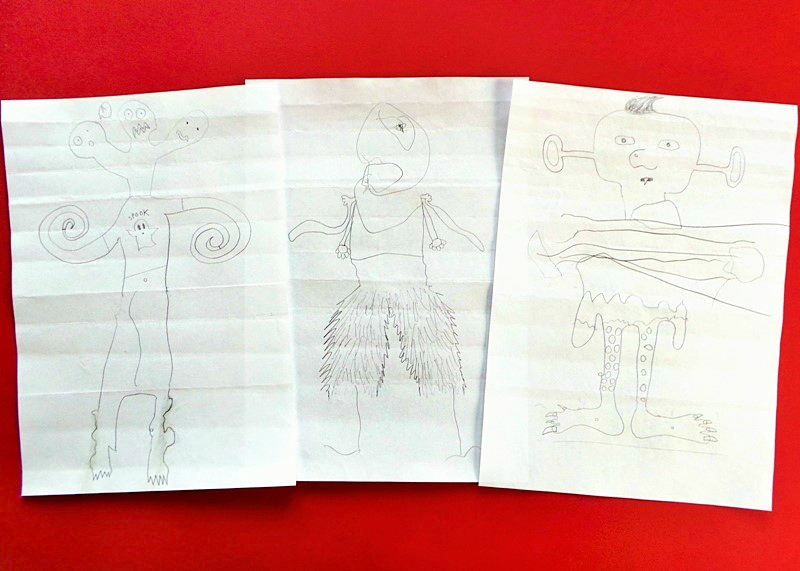 What do you think of our Halloween Monsters? Have you ever played Creature Consequences or Story Consequences? 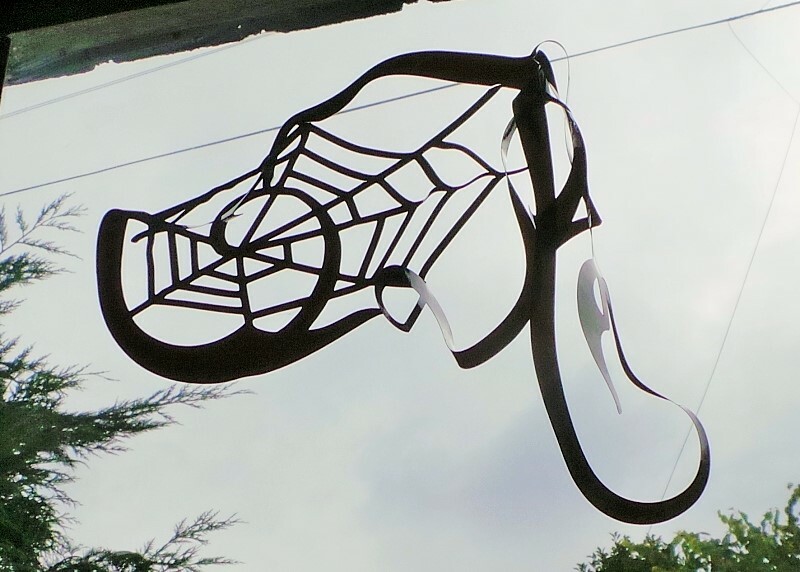 I’ll have some more Halloween projects appearing over the next week-or-so! 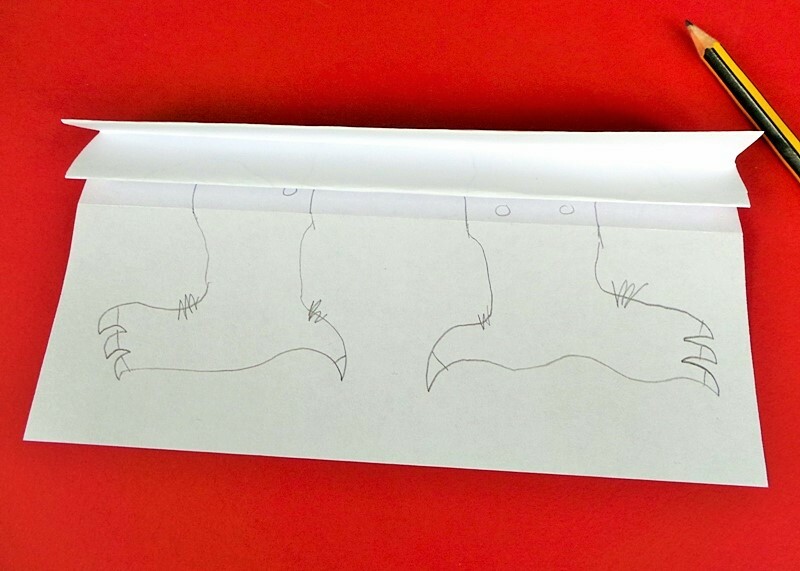 You can also check out the Staedtler Facebook Page or their Blog for more Monster inspiration! 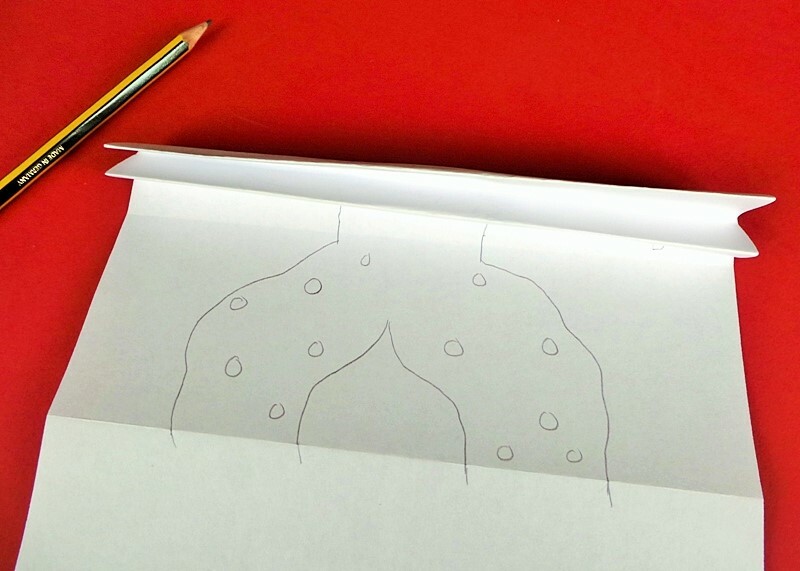 Disclosure: Staedtler sent us the products to use for this post, but all photos, text, and opinions are our own. 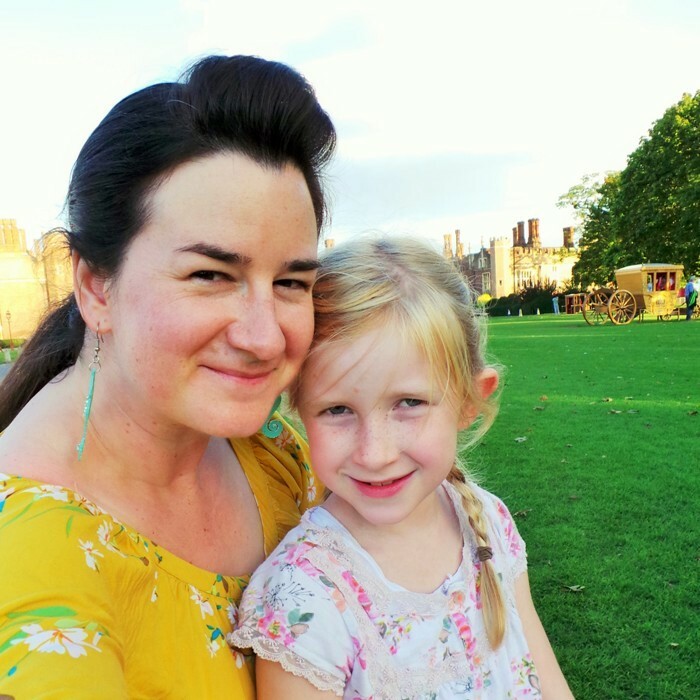 On Saturday the 19th of September my daughter and I drove to London to experience Kirstie Allsopp’s ‘The Handmade Fair’ at Hampton Court Palace. 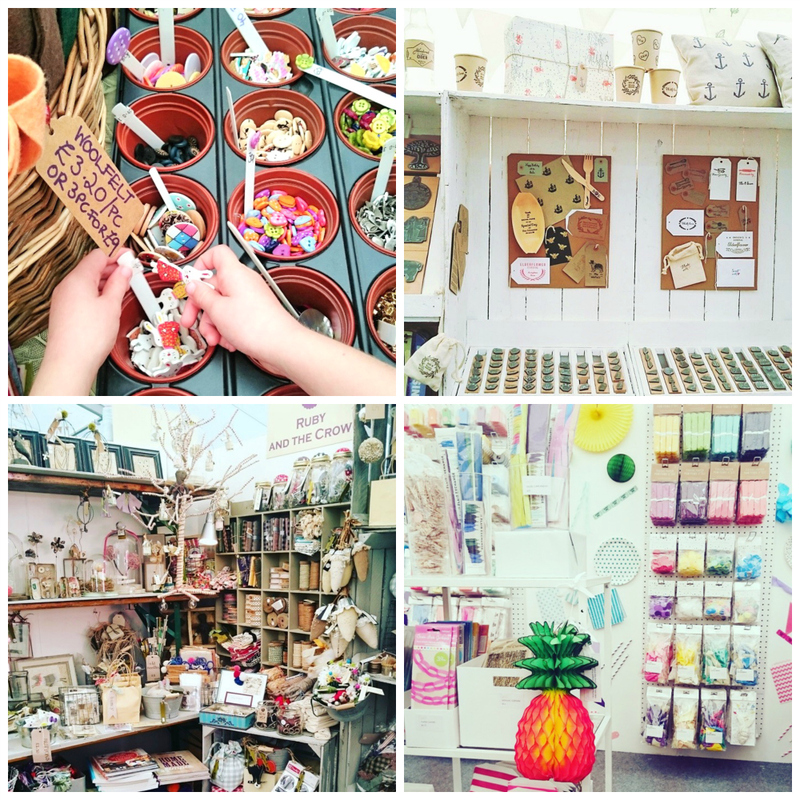 We had a lovely day, but also came away with a few niggles & tips, so I thought I’d do a review of The Handmade Fair to tell you all about it! 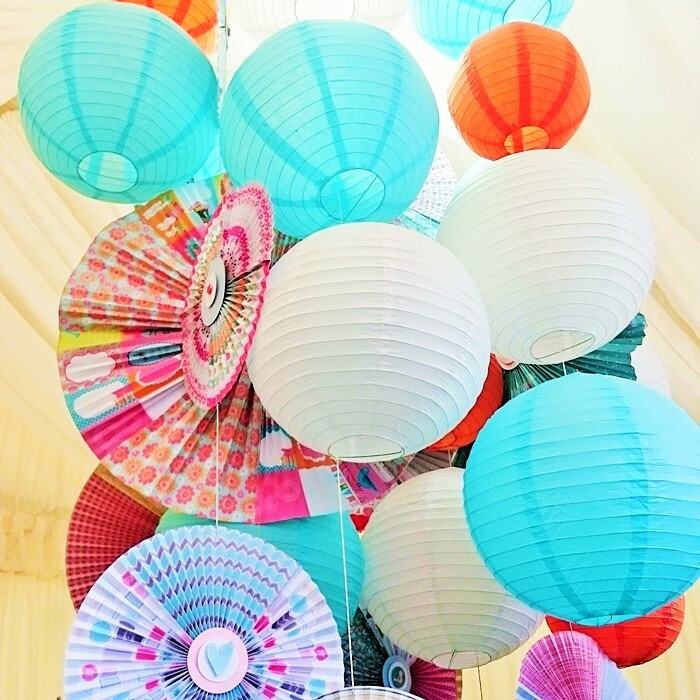 For anyone who doesn’t know, The Handmade Fair is a 3 day event with talks, workshops, and ‘grand makes’, as well as stalls selling handmade supplies and finished items – with lots of stalls doing demos too. We won the tickets from Hester’s Handmade Home on Instagram, though I did see quite a few people running giveaways for the tickets in the run up to the event! They were entry-only tickets, which meant I’d have to pay extra to go to any of the talks, workshops, or grand makes. 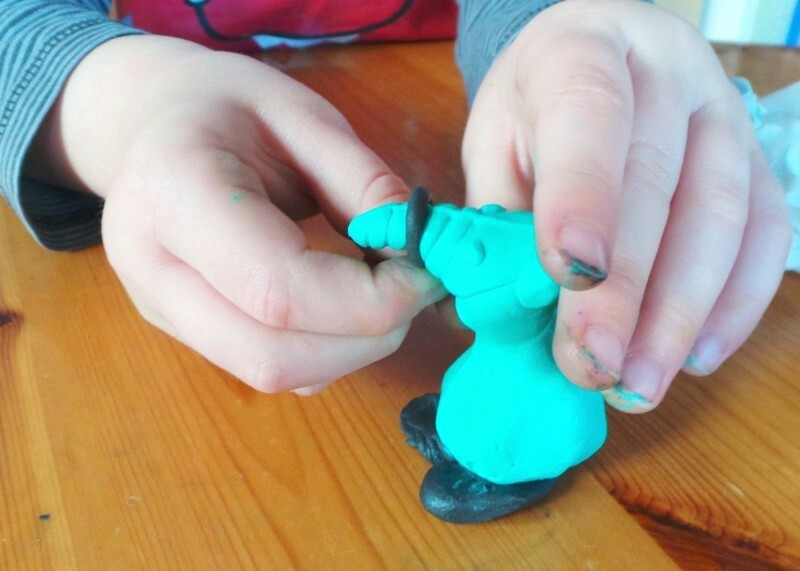 I didn’t bother upgrading our tickets as my daughter couldn’t join in with the crafting – children under 12 couldn’t participate in workshops due to ‘health and safety’ reasons. 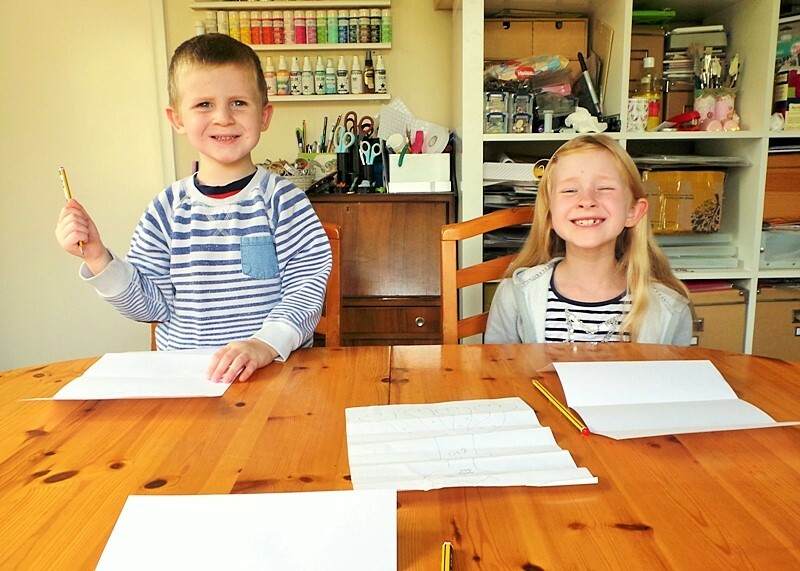 It seems a shame that they don’t have at least one child-friendly workshop a day, as my daughter is a super keen crafter, and it’s good to nourish the next generation of creative minds! 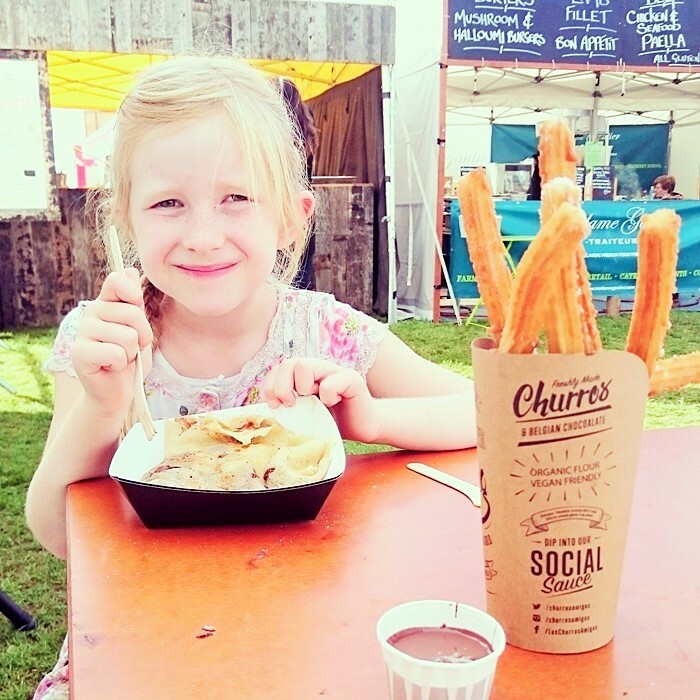 We didn’t make it to the fair until 11.30am, as we got stuck in a ridiculous amount of traffic – the last little bit of the journey from the M3 to Hampton Court should have taken 15mins and actually took 1 hour and 45 minutes! The last 30minutes was driving from the full-up green car park to the further away blue car park. I may have cried a little bit when they said the green car park was full. I know the Handmade Fair organisers can’t help the traffic (there was extra traffic because of rugby and other events), but you would think they could find a venue with a bigger car park for all the attendees. 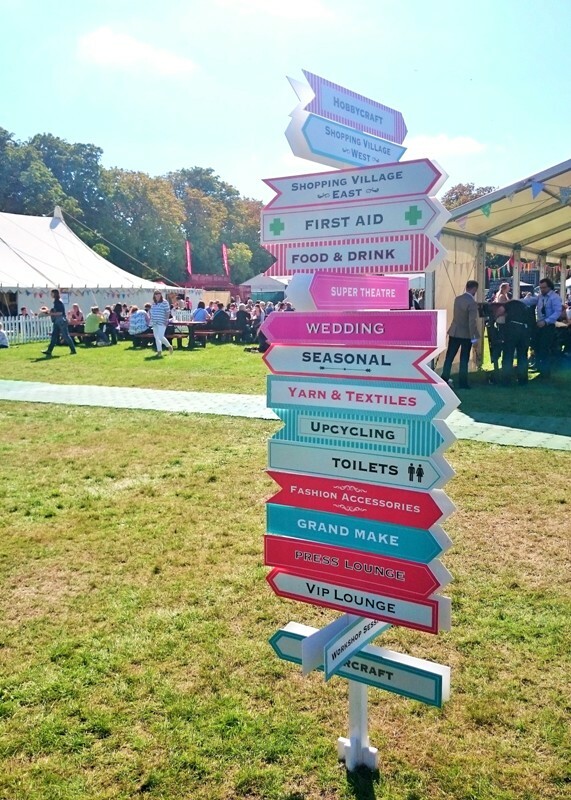 It wasn’t like they were using the grandeur of Hampton Court Palace at all, as the Fair was over the road from that, on ‘the green’ which, let’s face it, is basically a field. A new, more accessible venue next year please?! Top left = Cool Crafting (where we got some cute wooden buttons / pendants), top right = The English Stamp Company (where I bought a stag stamp), bottom left = Ruby And The Crow (where we bought some gorgeous ribbons), and bottom right = Peach Blossom (where we didn’t buy anything though I was seriously tempted as it was all so pretty!). 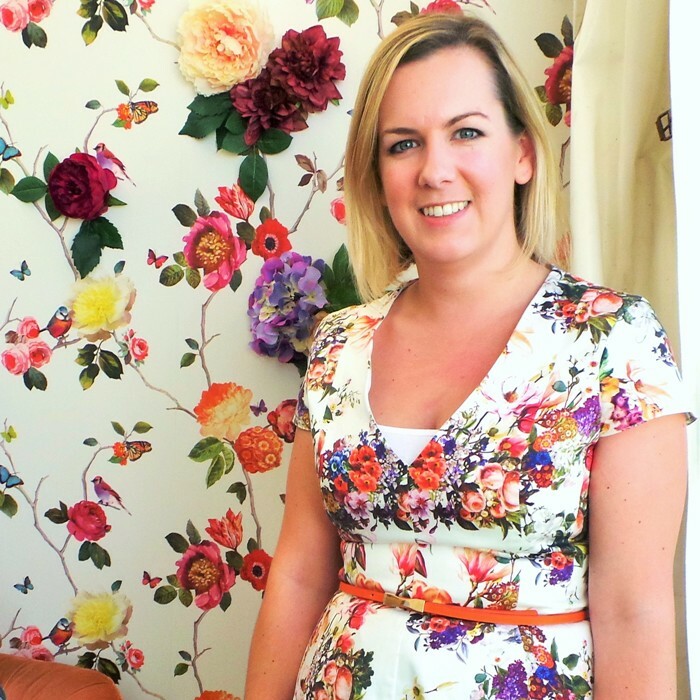 We popped by a couple of the stalls doing free workshops – Craft Asylum and Janome, but their next workshops were full. 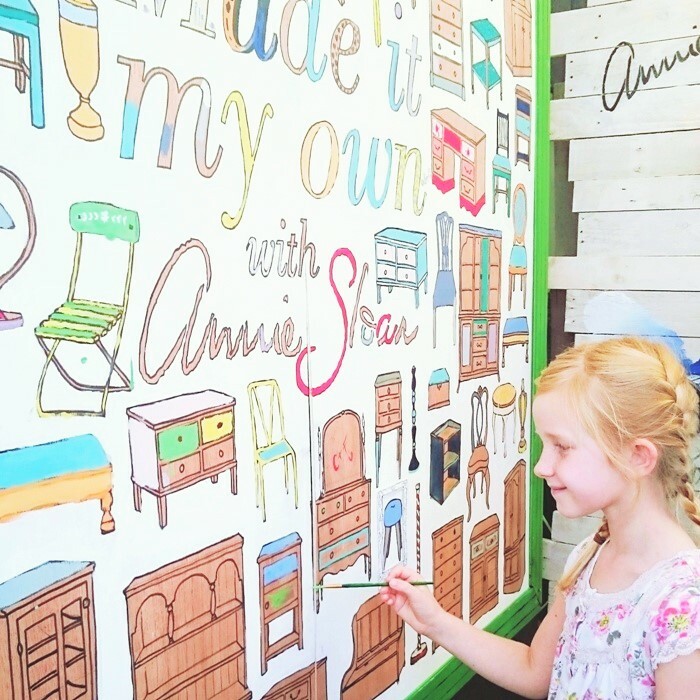 So we continued our wander and stopped by the Annie Sloan Chalk Paint tent, where you could paint the furniture pictures on the wall. Little Miss really enjoyed this. Someone had already painted a bit of blue on this side-table, but she painted the rest green and orange, then I added white polka-dots to the blue bit. We were there for a while! 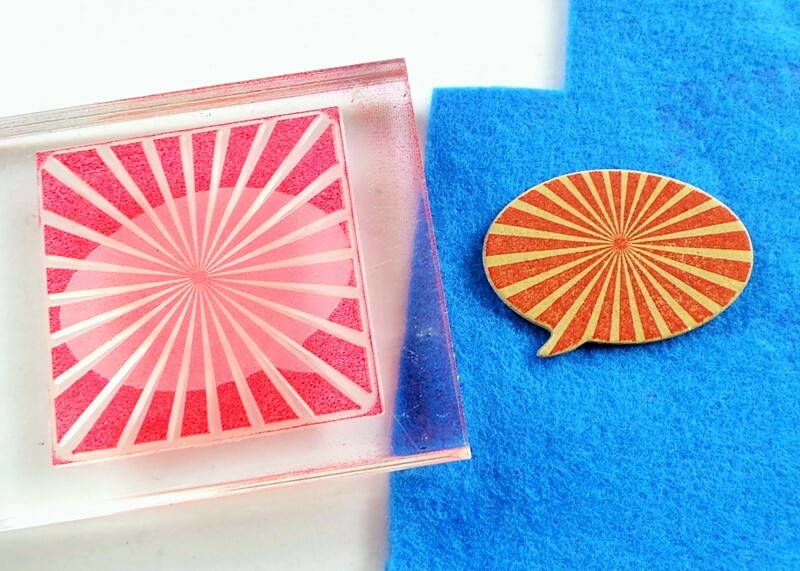 I wrote a post (HERE) back in May about how I was interested in using photo props and experimenting, so I really loved this workshop. Louise also gave great tips about scheduling your instagram photos and what times to post them, etc. 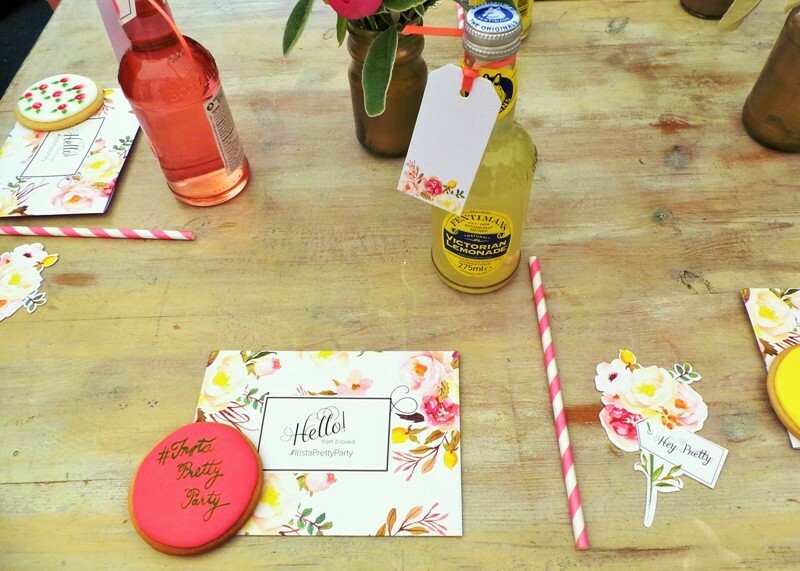 It was fun to be in a room of other excited bloggers too! The BLoved Instagram account is HERE if you want to see some of their photos. 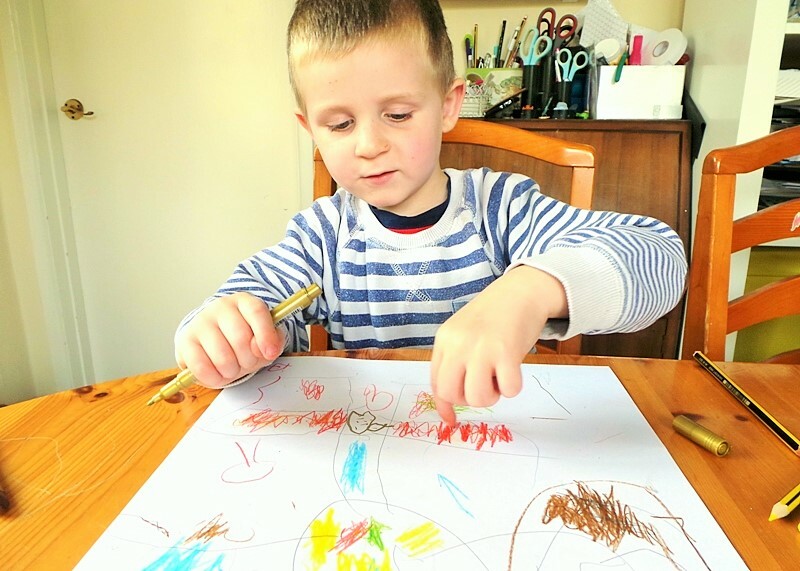 After this we visited the Mollie Makes tent, where Little Miss did a bit of colouring, and I browsed the books and picked up a free banner-making kit. It was also somewhere that you could get a cup of tea and a bit of cake, though when we were there they had run out of teacups! 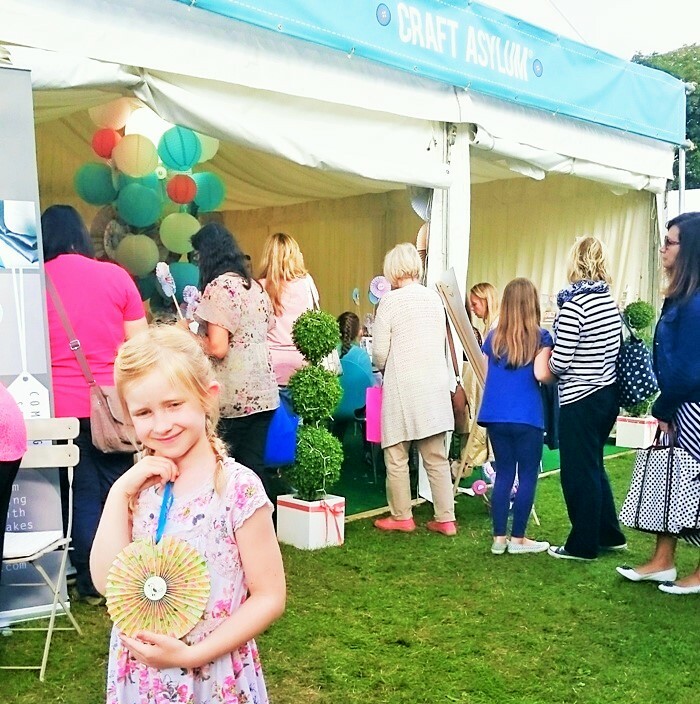 We headed to the Craft Asylum tent for the next workshop but it was full again. So we ate a bit of our packed lunch, then went back there again for the next workshop – arriving half-an-hour before it this time to be sure of our place. A queue formed behind us so it was definitely the right decision – if you want to attend a free workshop, get there at least half an hour beforehand! We also bumped into Dorothy Wood and Suzie Candlin who I’d last seen at Creative exchanges too. It was really fun spotting people who I knew and introducing Little Miss to them! 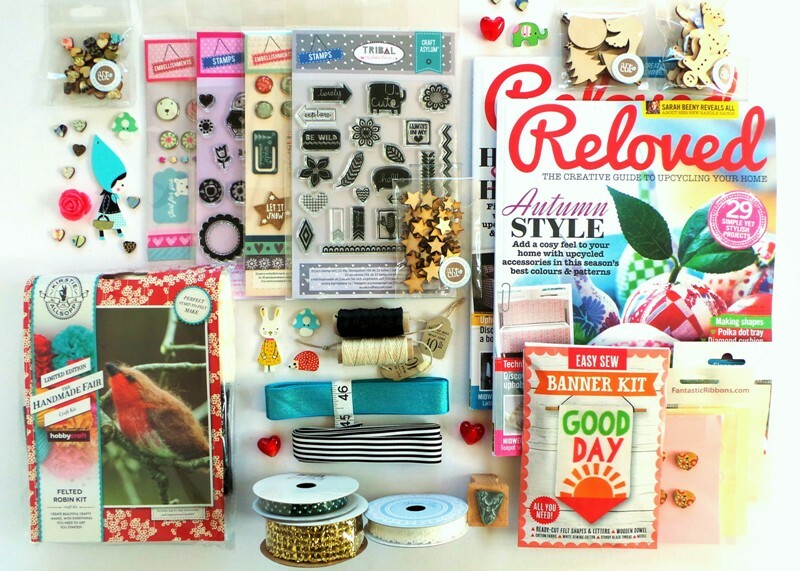 The banner kit is the free one from the Mollie Makes tent, and the Reloved magazines were in a £5 goody bag with some ribbons and buttons. 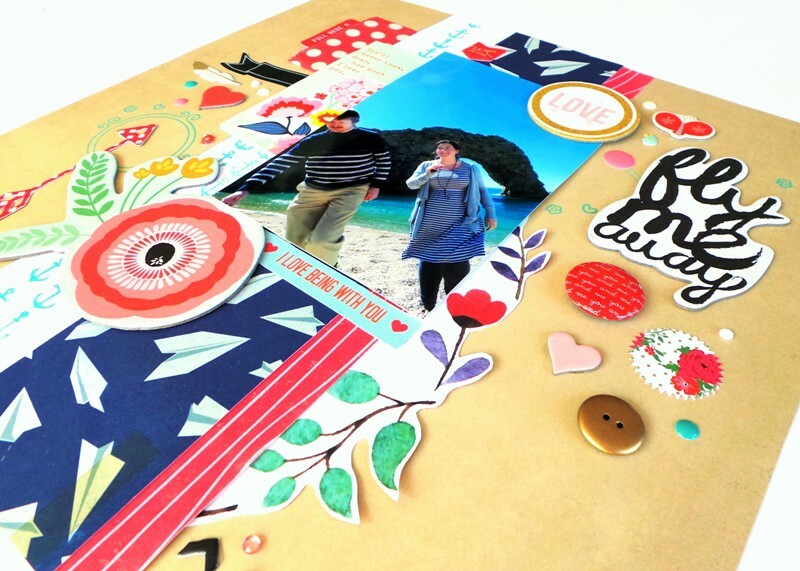 The Craft Asylum deal was the best in my opinion, and 4 stamp sets and / or embellishment sets for £10! 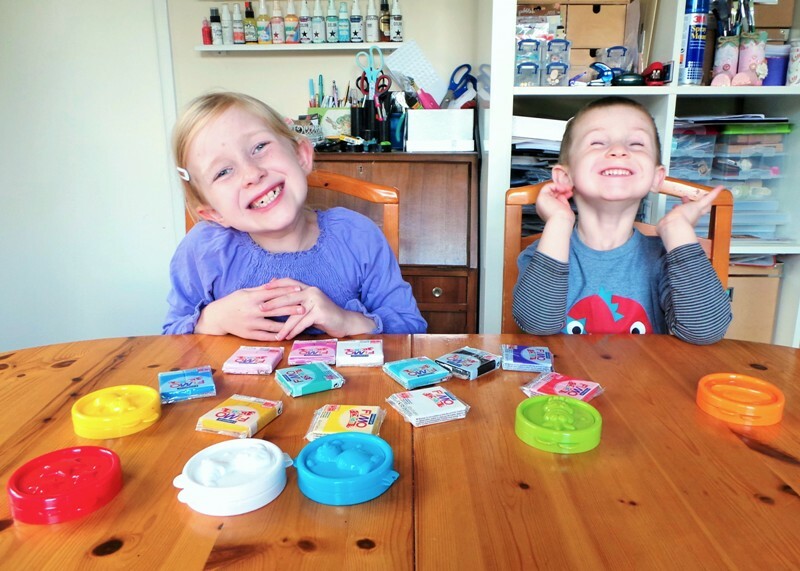 We each chose a stamp set and a embellishment set from there. Then we walked back to the car park… which I admit didn’t seem so far away now that we weren’t in a hurry! Thankfully there was no traffic on the way home, so we got back at a reasonable time, feeling very happy with our purchases and our mummy & daughter date! My heart just melted. There’s my girl! We would definitely go to The Handmade Fair again. But I’d love them to include a workshop that kids can join in with. And I think a new venue with more parking would be good, but I guess they need to make sure it’s accessible by public transport too. I did consider taking the train but it cost more and would take longer (when there’s no traffic). Perhaps I might brave the train journey next year. 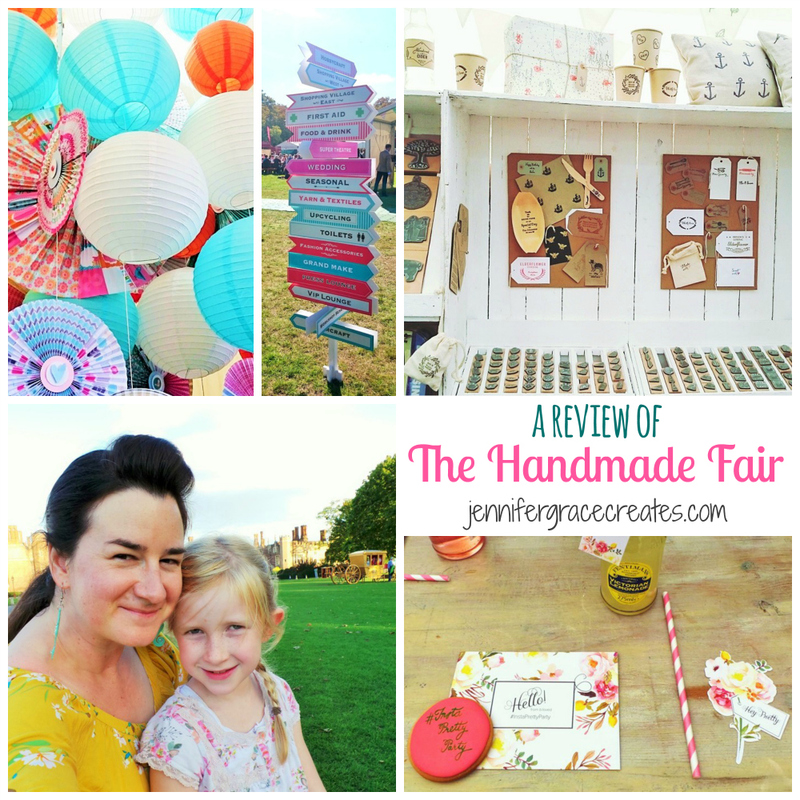 Did you go to the Handmade Fair? Would you like to? I hope you have a lovely, crafty, day. 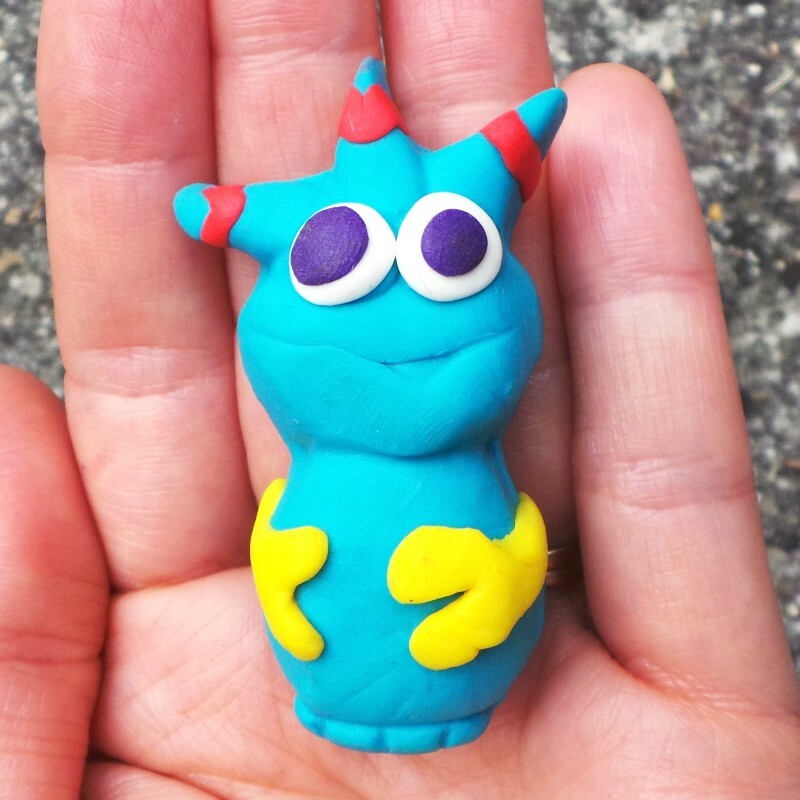 Today I’m sharing our first Try-It tribe project – some alien toys using the kids Fimo moulds! 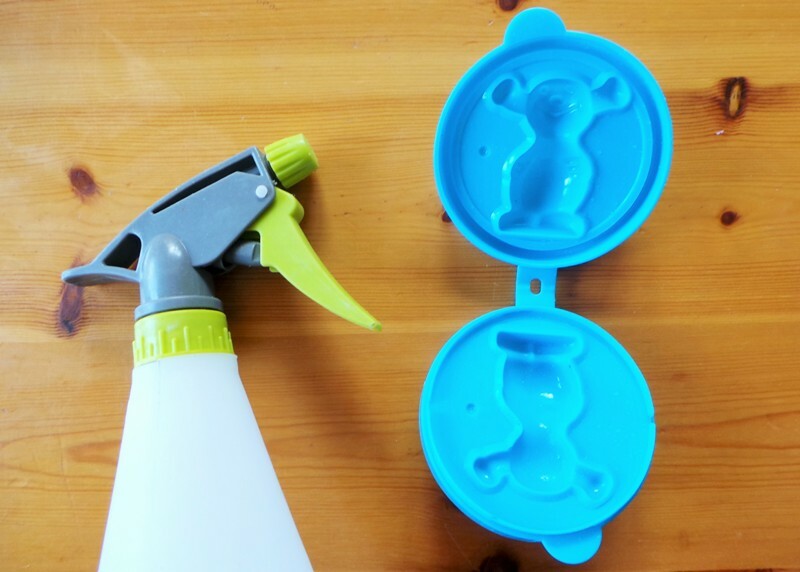 We had tons of fun making these, and we definitely picked up a few tips for how to use the moulds along the way too! 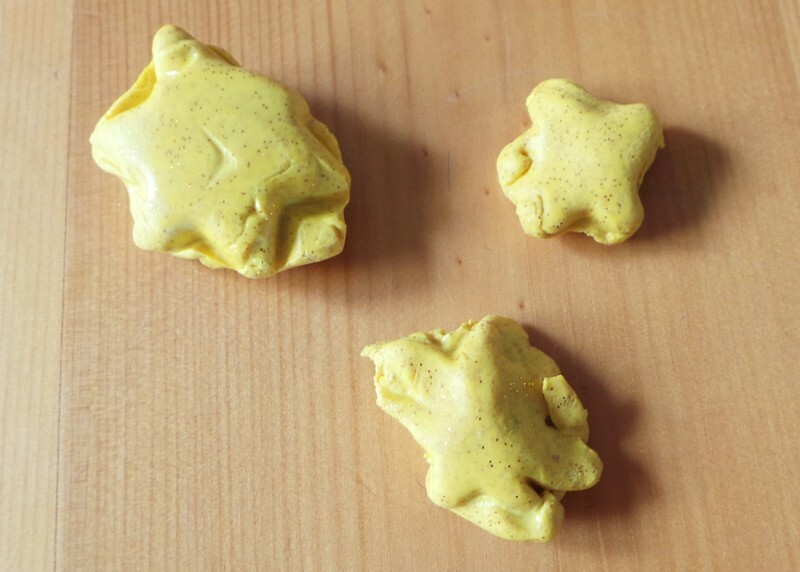 For those that don’t know, Fimo is a modelling clay which you can shape, and then bake it in the oven to make it solid. 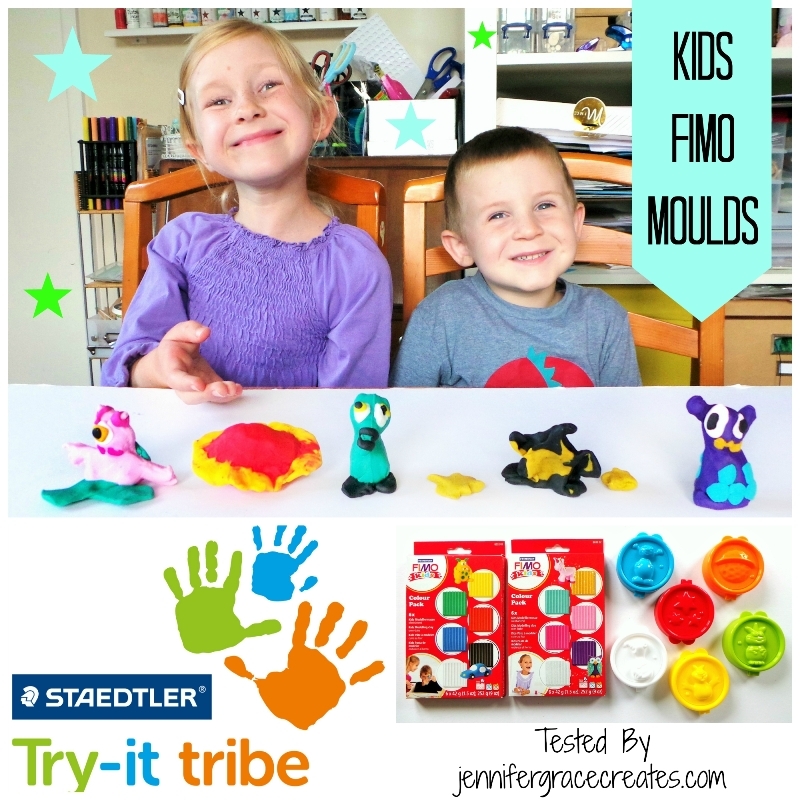 This is kids Fimo too, which seems to be extra soft – great for making it easier to shape! We smoothed it out a bit then left it to dry for 5 mins or so, and it turned out fine. 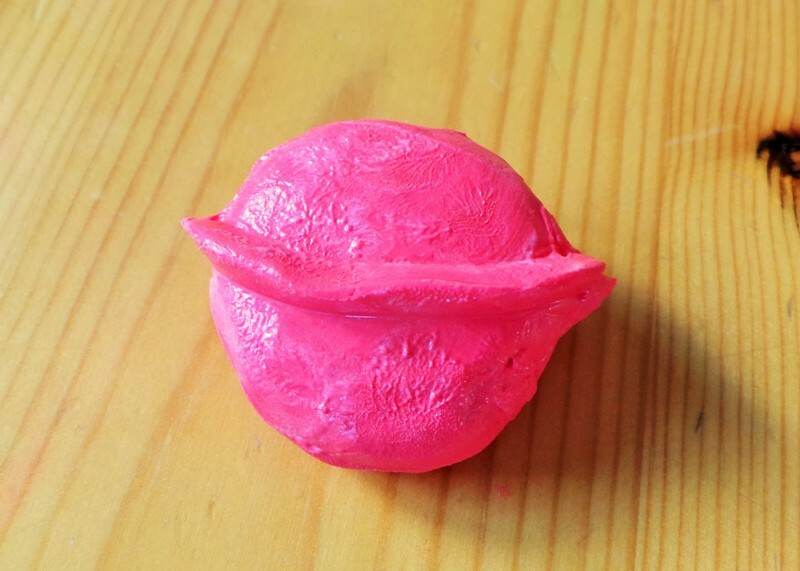 A lot of the moulds have details that leave impressions on the surface, like eyes and arms on the aliens. 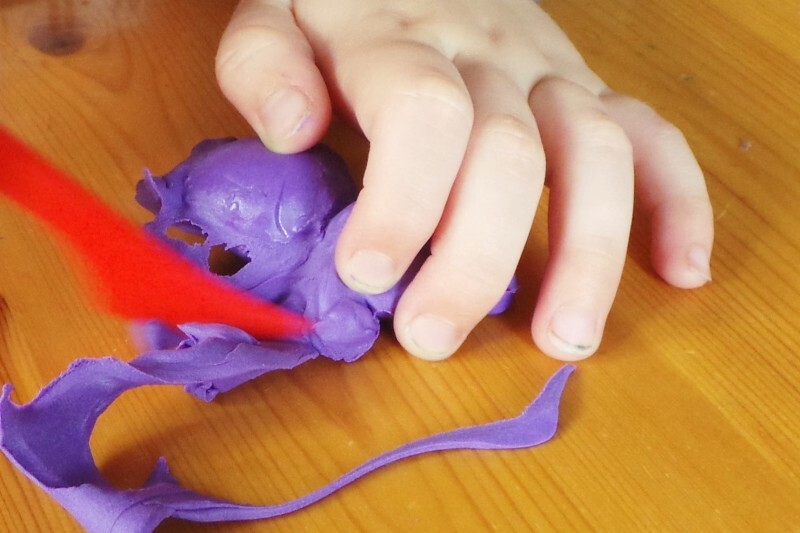 However, these details tended to get lost when we were removing the excess Fimo and handling the models – I think this was partly due to the kids Fimo being that bit softer – it was easy to accidentally smooth the details out! I should also point out that we used baby wipes to clean our hands in between colours. After making a red planet Little Miss had to go and wash her hands as her hands were so red! It came off easily enough though. 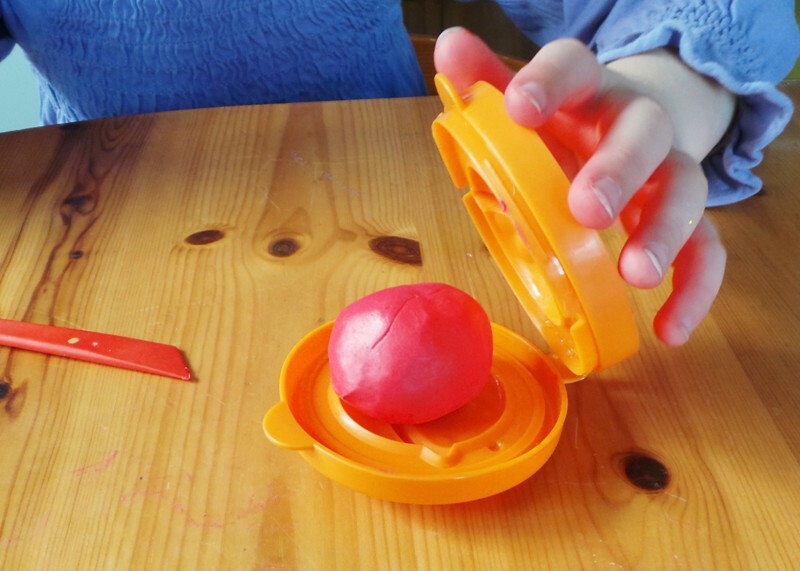 I don’t think Fimo is really designed to make toys – I know that pieces may eventually break or fall off. But as there aren’t any thin or fiddly bits on these they should last a while. The kids have been bashing them around in their games for a few days now and nothing’s broken yet! Little Miss calls them her ‘miniaturisers’… which she thought meant that even though they were little they could do big things. 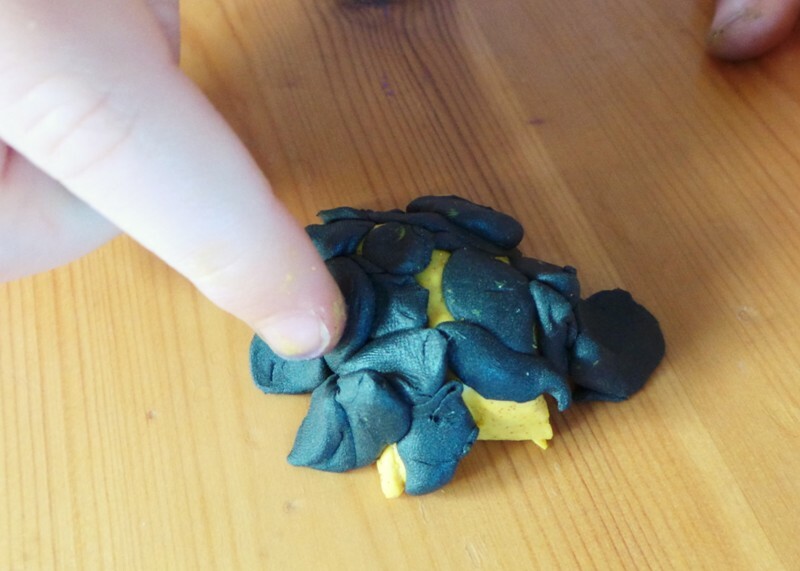 She also likes the idea that they can turn things tiny, now that I’ve explained it! See, we are learning as well. 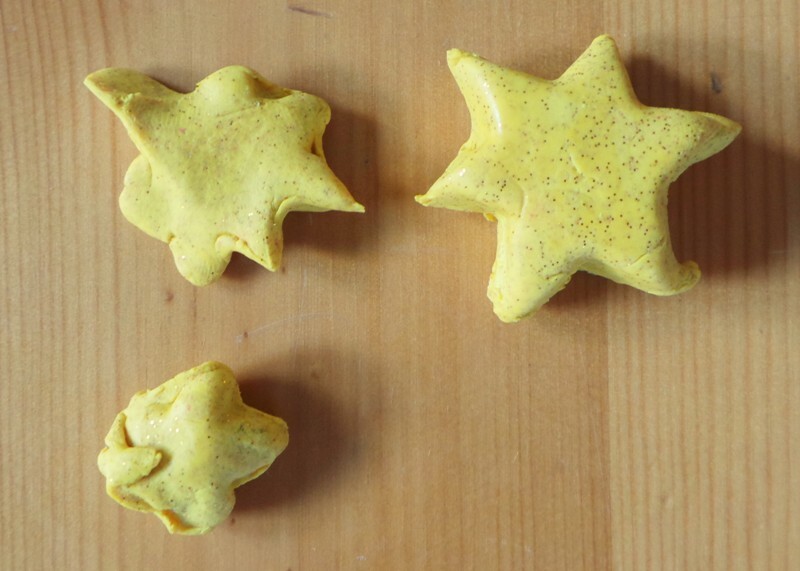 I was really happy with how much the kids enjoyed making these, and I was surprised by how much Cheeky Boy (who turned 4 a few months ago) could do by himself. 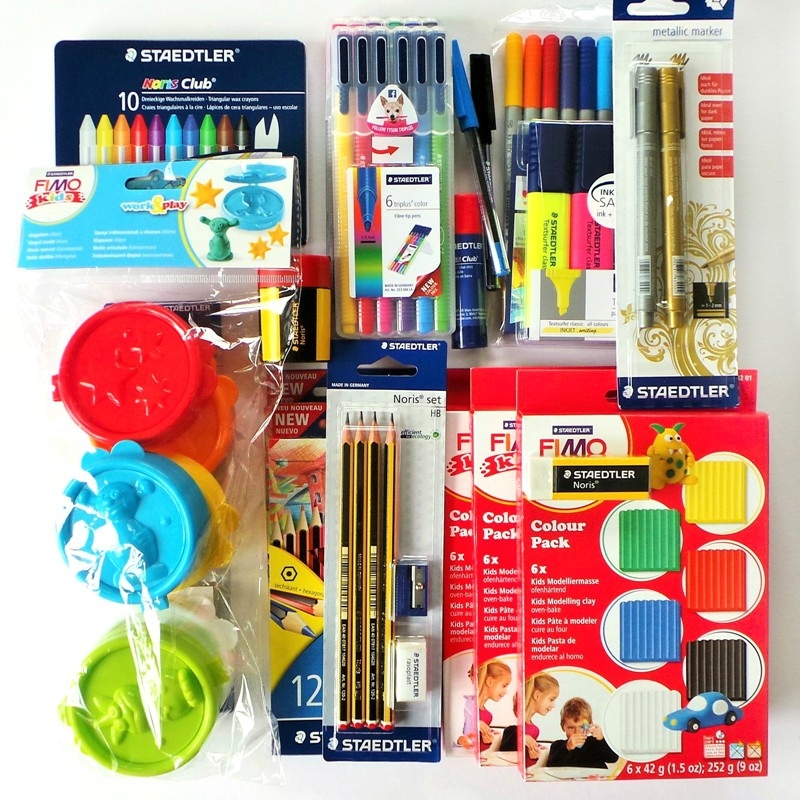 We can’t wait to try our next Staedtler project! 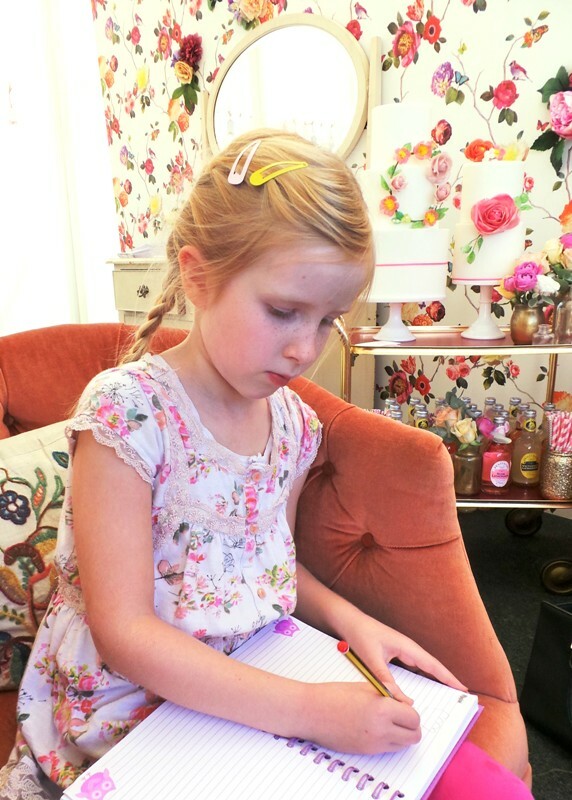 For more from Staedtler check out their blog HERE. I think the kid’s ones are better, but I like my little alien too! 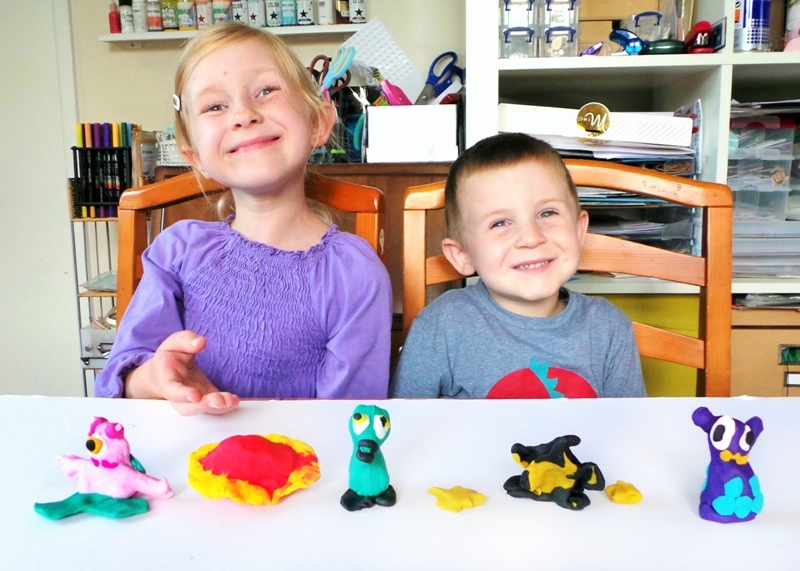 Have you ever tried using Fimo or modelling clay? 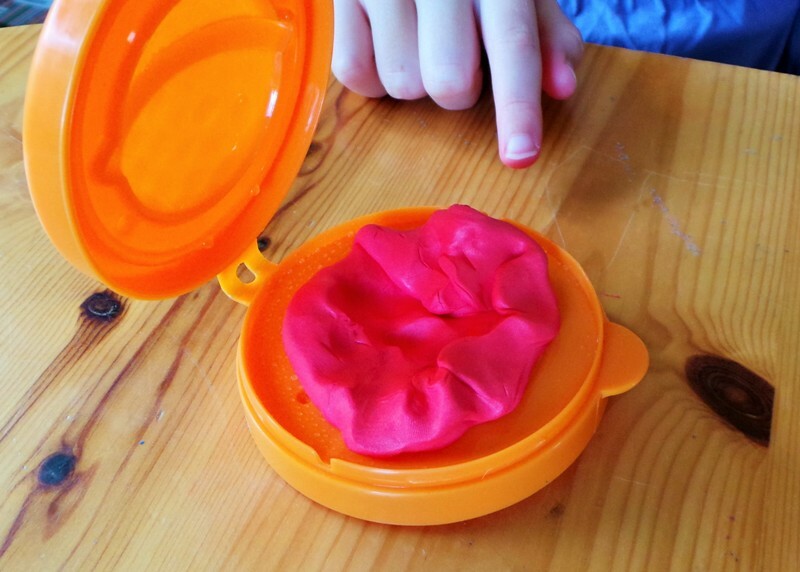 I used to make earrings with it too so I might get Little Miss to make some jewellery next. 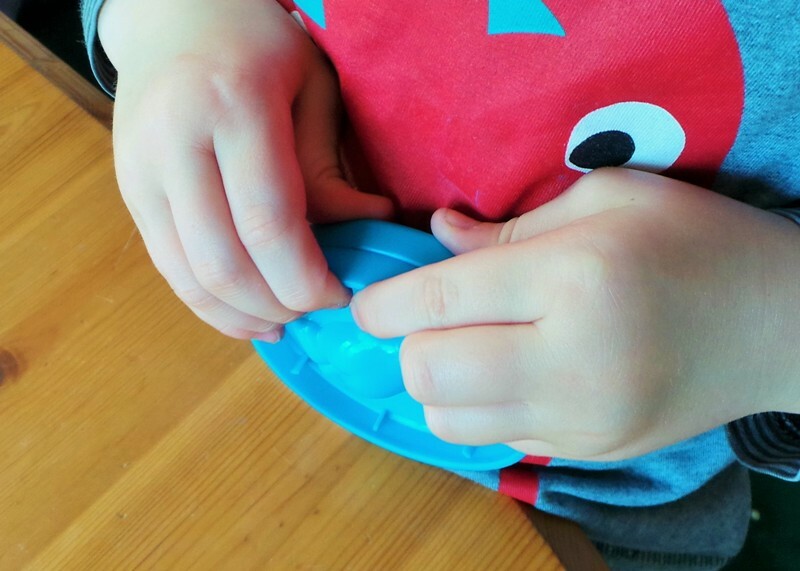 I’m linking this up to the Tuesday Pintorials Linky Party! 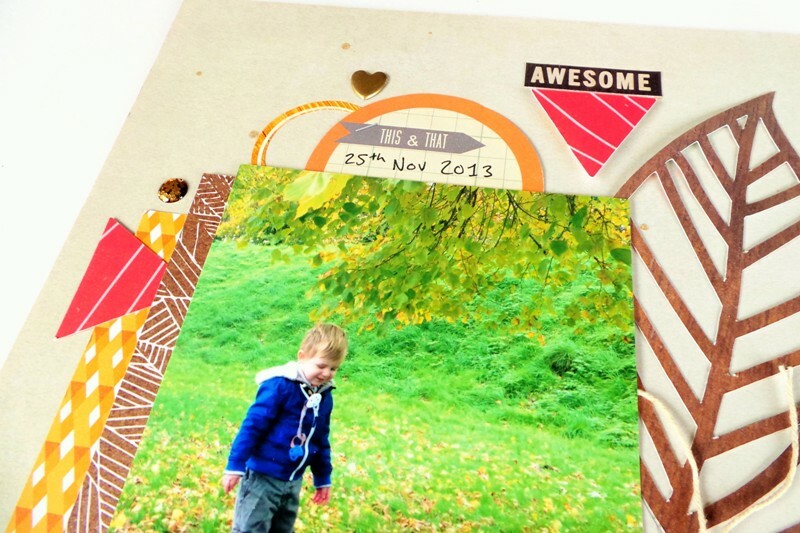 Today I have an Autumn scrapbook layout to share, as I’m feeling the change of season here. 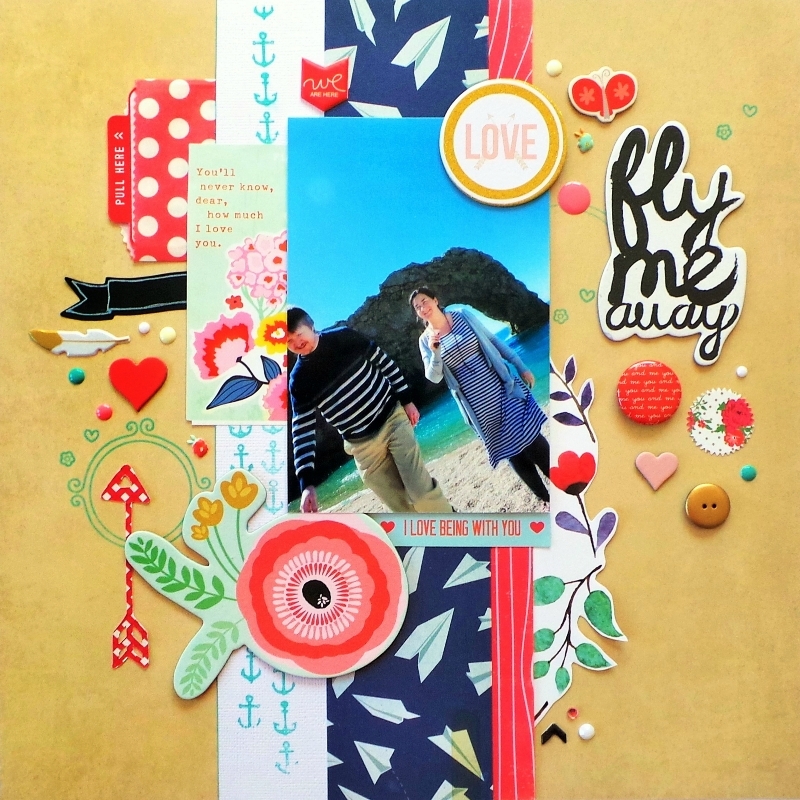 I created this for the Hip Kit Club DT call which ended at the beginning of this week. 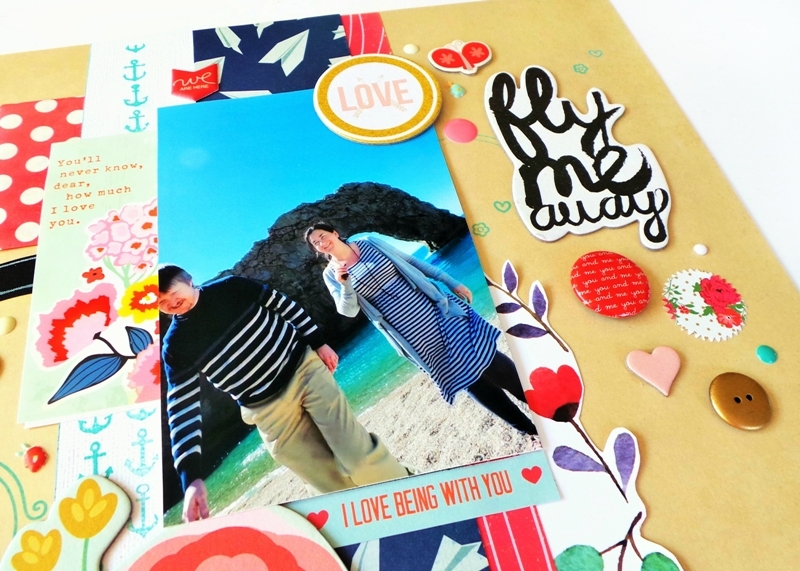 You had to make one layout in response to the call and I wasn’t sure if I was supposed to keep the page a secret or not, but I’ve just seen that someone asked on FB if it was okay to share it and the answer was yes! 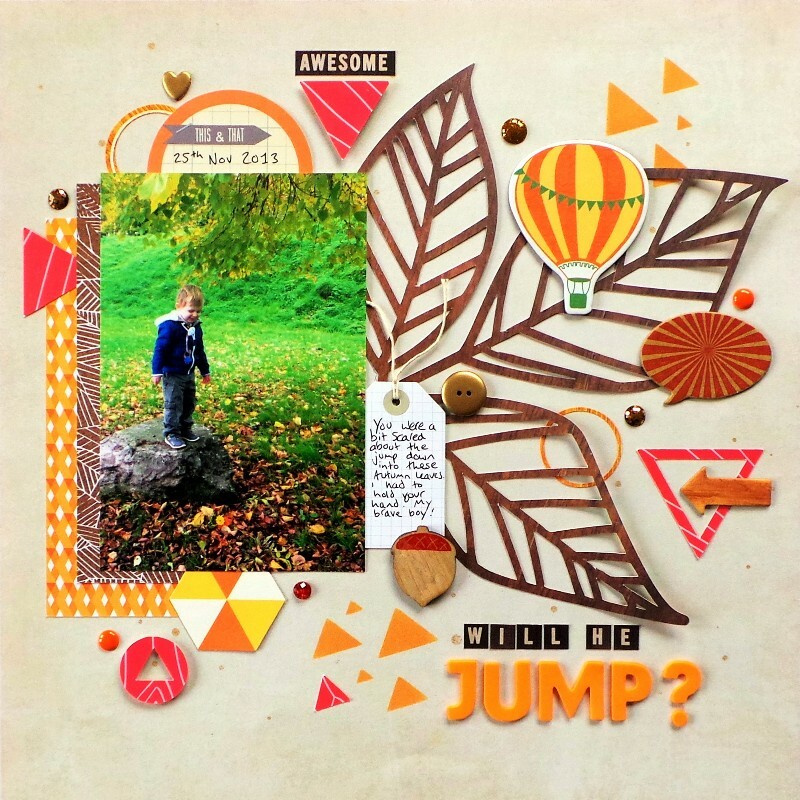 I also used a Cut Shoppe file on here so I’m going to link it up to their September monthly challenge on their blog HERE too. This photo is a perfect example of my cautious children. They don’t like to take risks and would always rather hold my hand if they are going to balance on something, or try to jump. I did end up having to hold cheeky boy’s hand after I took this photo! I used a prompt from the Hip Kit Club Members Forum on Facebook, which was to ‘use embellishments around the edge of a large shape’. As you can see I chose to use a leaf – for which I bought a new cut file set called ‘Leaf It To Me’ from The Cute Shoppe on Etsy. 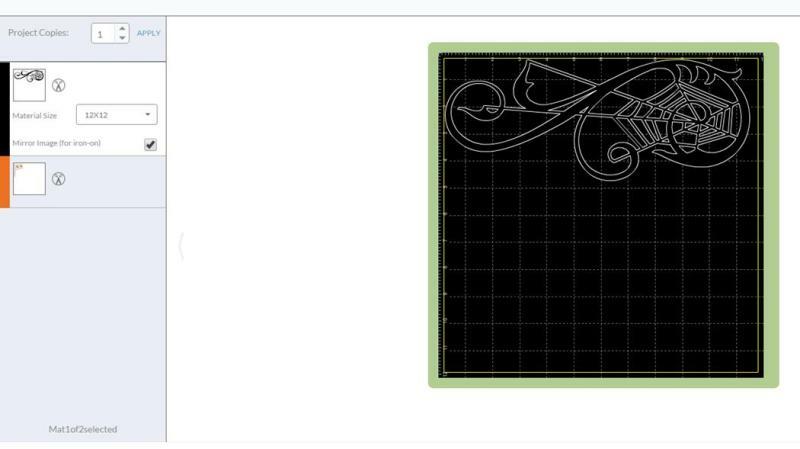 I cut one of the leaves from a piece of woodgrain patterned paper using my Cricut Explore, then I started working out how to arrange things around it. I sprinkled some gold mist dots on the background paper too. Then it was just a case of moving things about until I was happy with them! I went for a nice eclectic mix as usual. 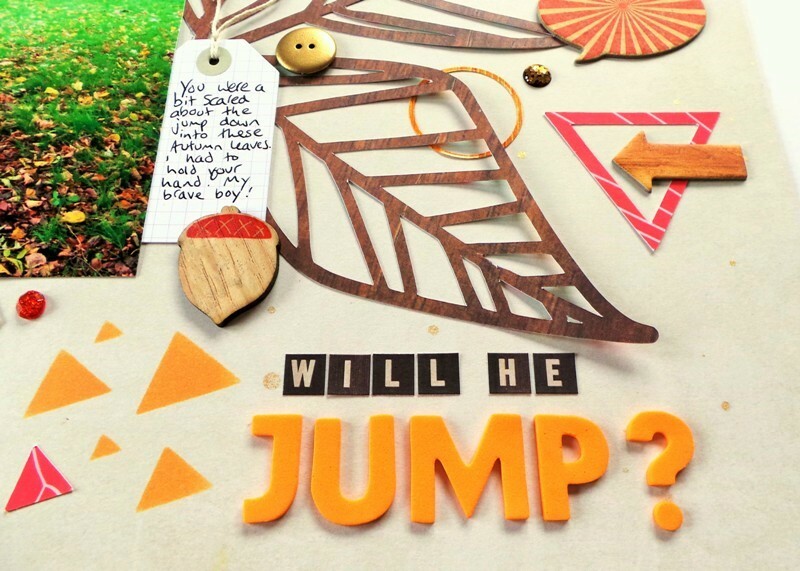 The red paper triangles were cut using a free download from the Hip Kit Club Shop – you just have to create an account using your email address, and then you have access to free cut files even if you aren’t a subscriber! Score! 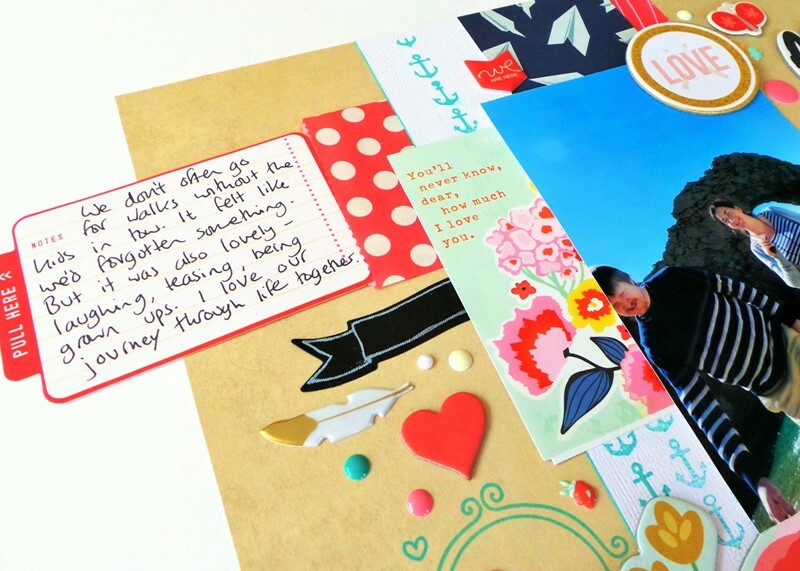 I loved making this layout, because cheeky boy has started school now, and this photo make me think of all the times we went for a walk while his big sister was at school. I’m so glad I capture moments like this. Is it feeling like Autumn where you are in the world? 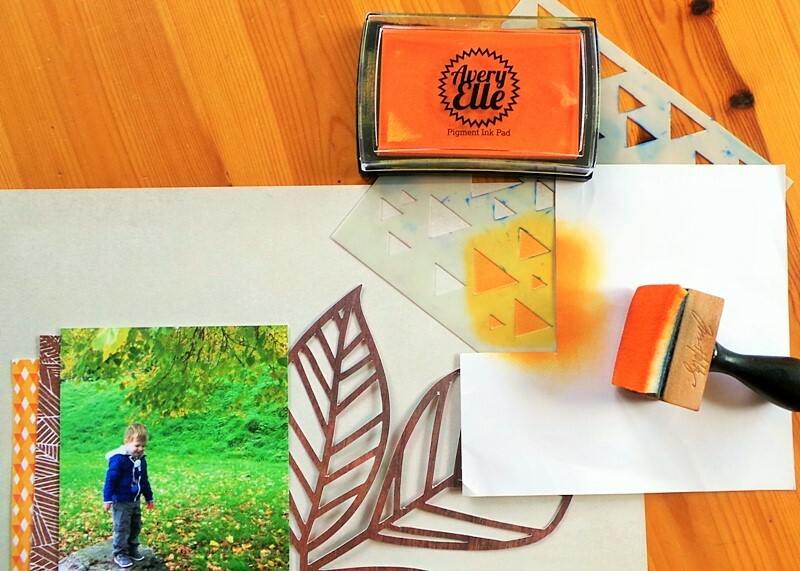 Have you made an Autumn crafts? leave me a link if so! Isn’t it gorgeous? I couldn’t resist the beautiful blues and reds! Well done to Mardi Winen who created it! I love the angle of this photo. It was taken by my Step-Dad as we were out for a walk with him and my Mum. No children in tow! What do you think? 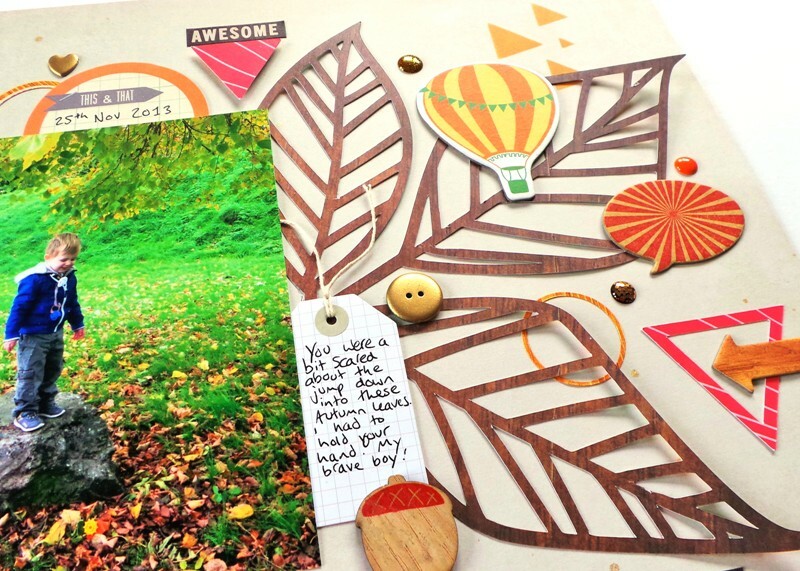 Are you going to have a go at the Jot Mood Board this month? It’s so pretty!